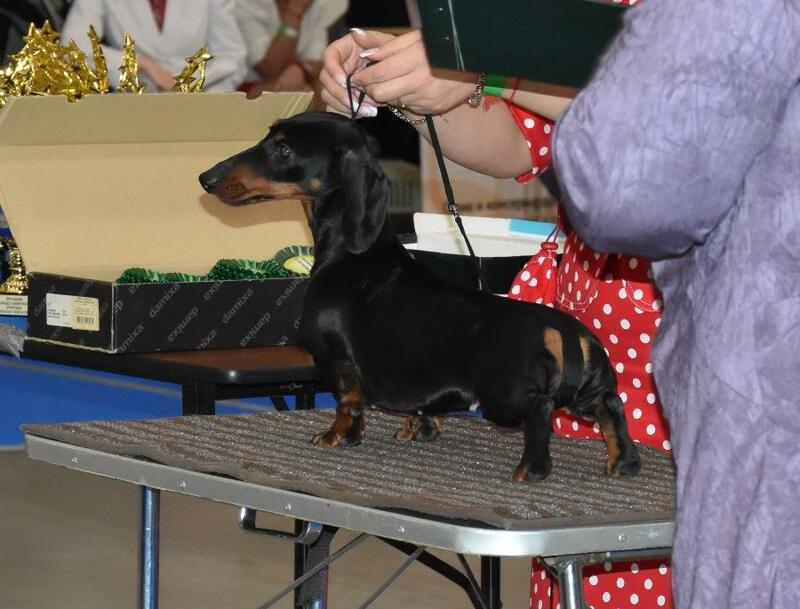 Live, my small silvery joy, good health to you!!! 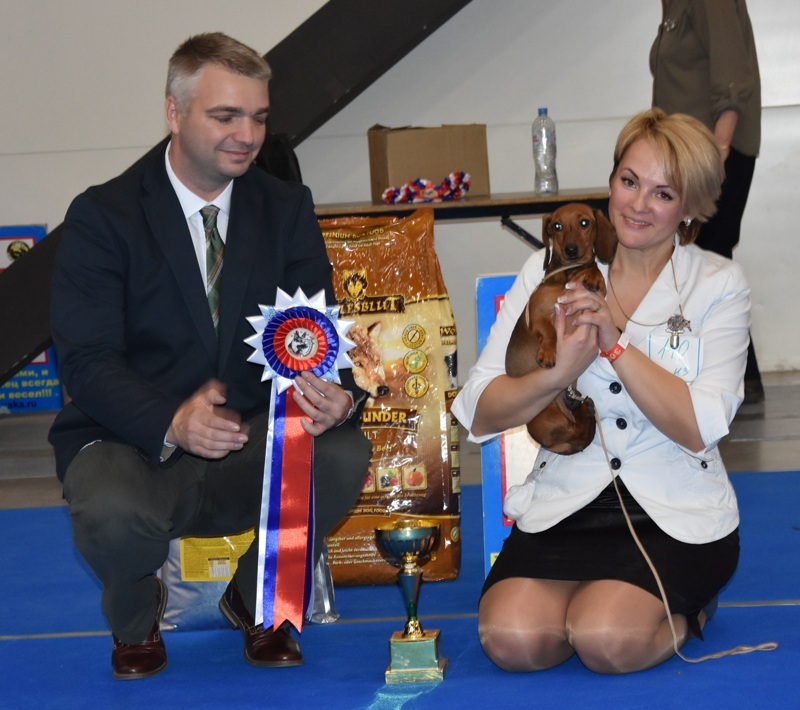 8.01.2018 - Magik Rainbow Lara Croft MS - new Junior Champion Poland!!! 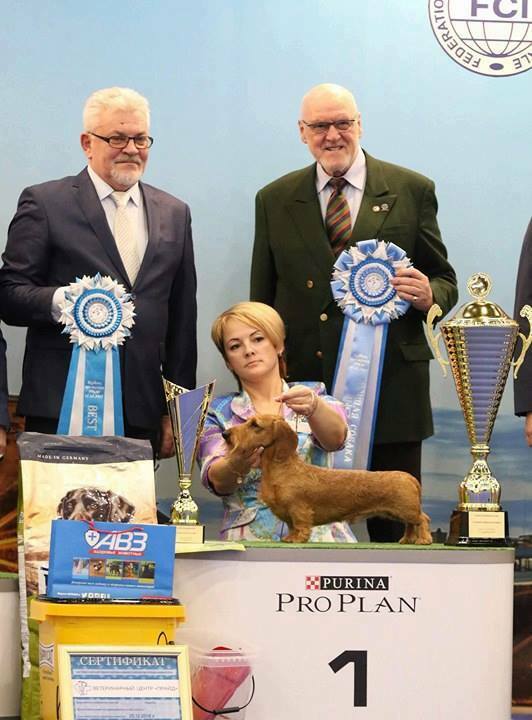 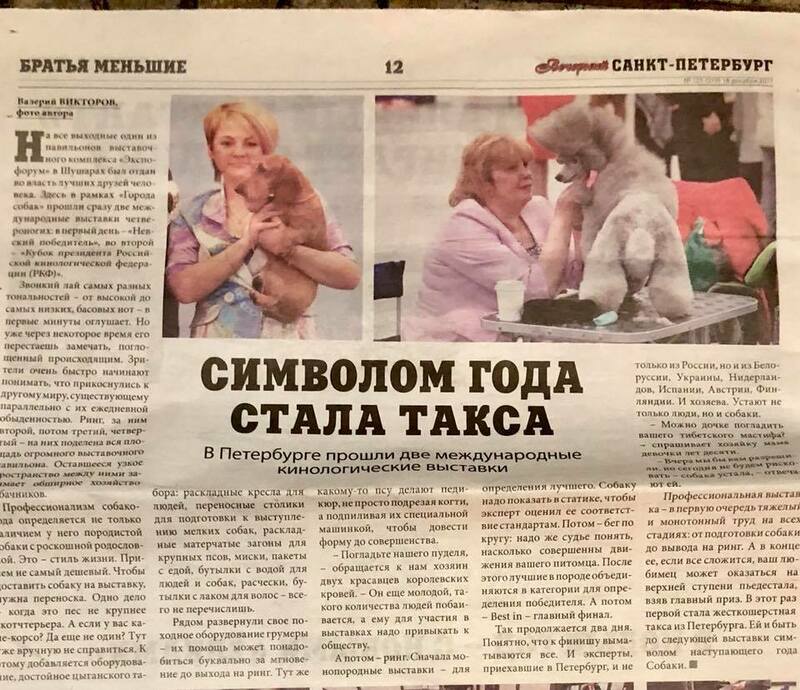 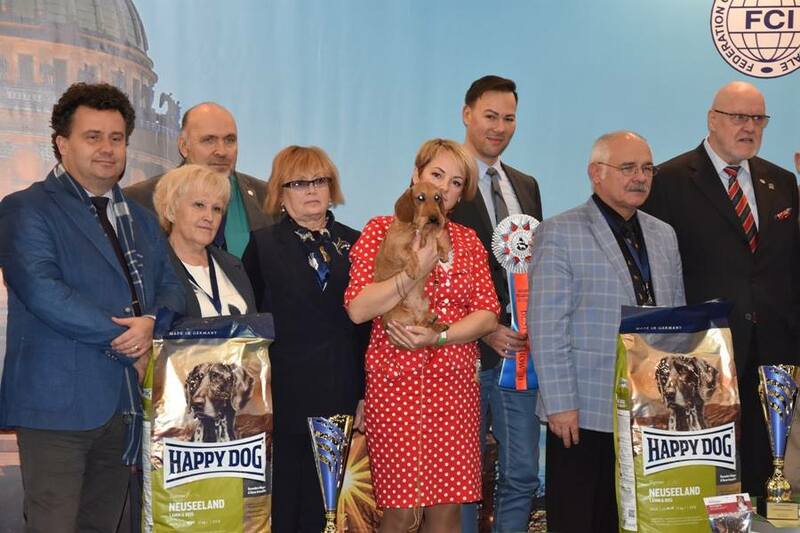 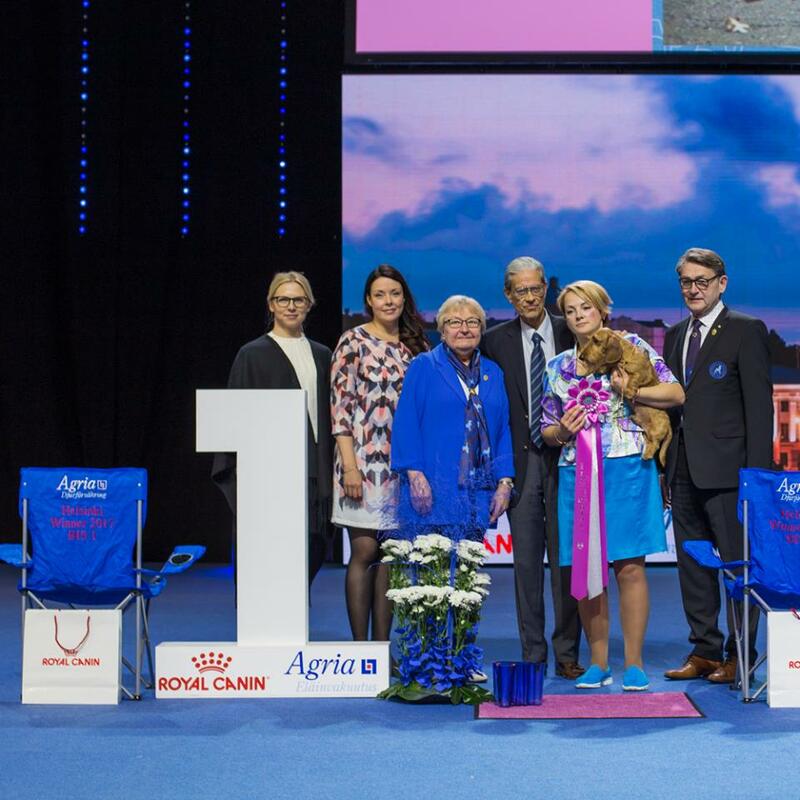 1.01.2018 - The large newspaper of St. Petersburg has published the report on our victory on the International show and has named our winner - the Symbol of 2018 (Year a yellow Dog)!!! 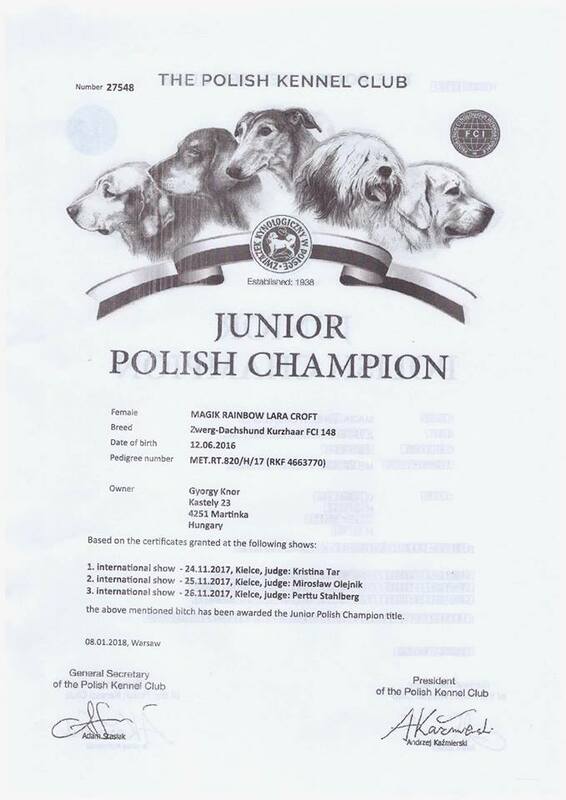 I very much am proud! 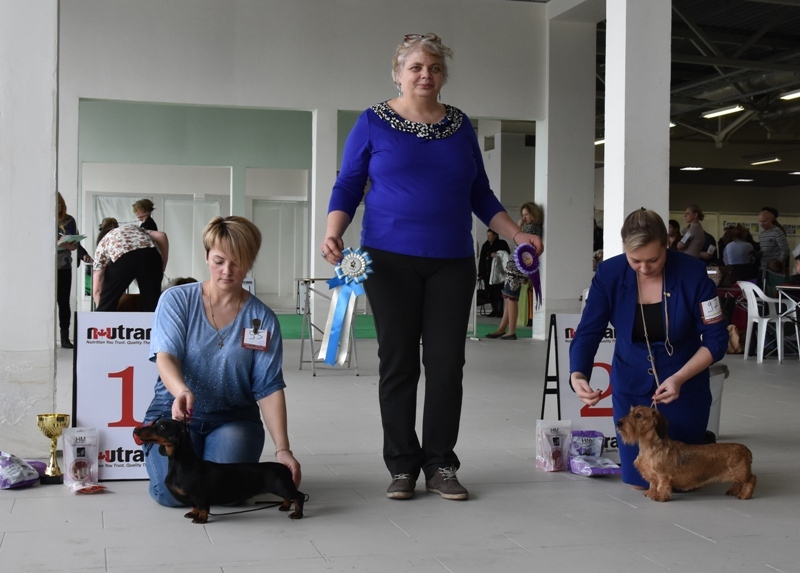 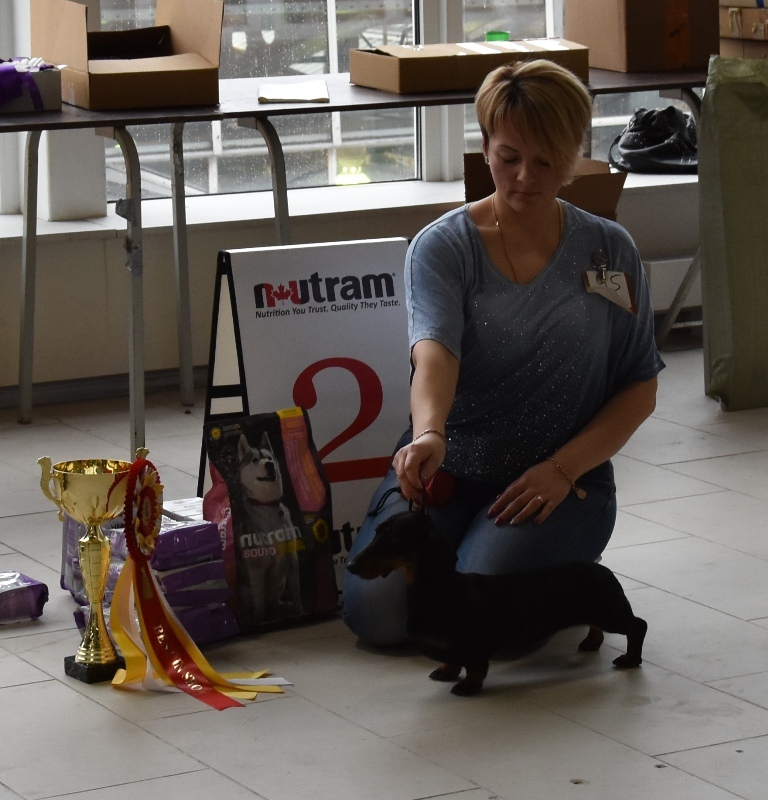 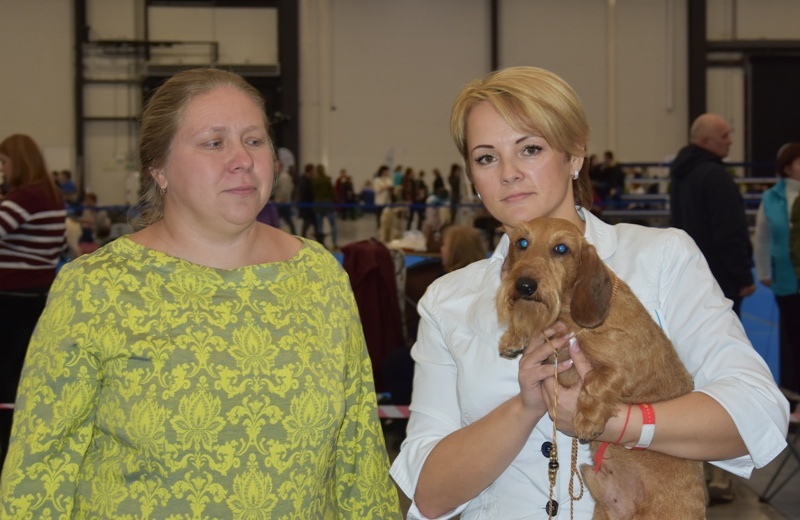 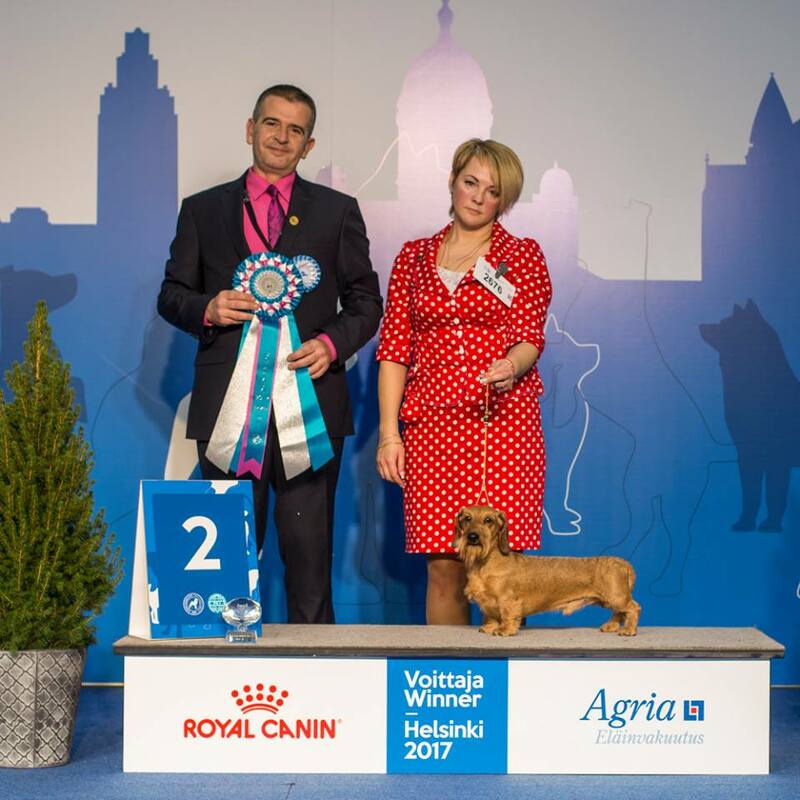 17.12.2017 - BEST IN SHOW-1 Int. 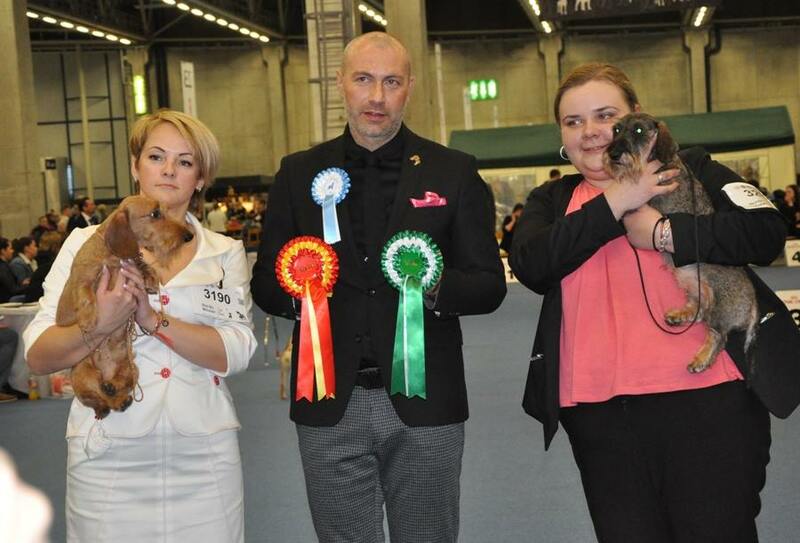 "Cup of President RKF" in St. Petersburg - Magik Rainbow Verino Roberto Gold MW!!! 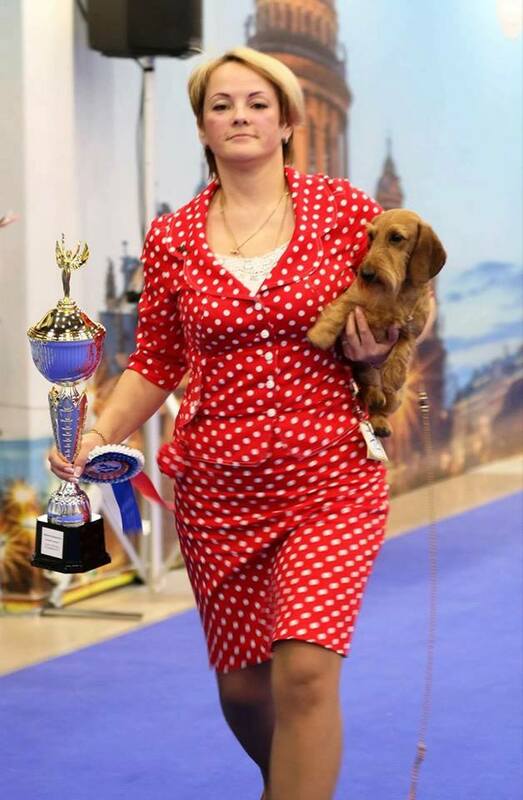 16.12.2017 - Res. 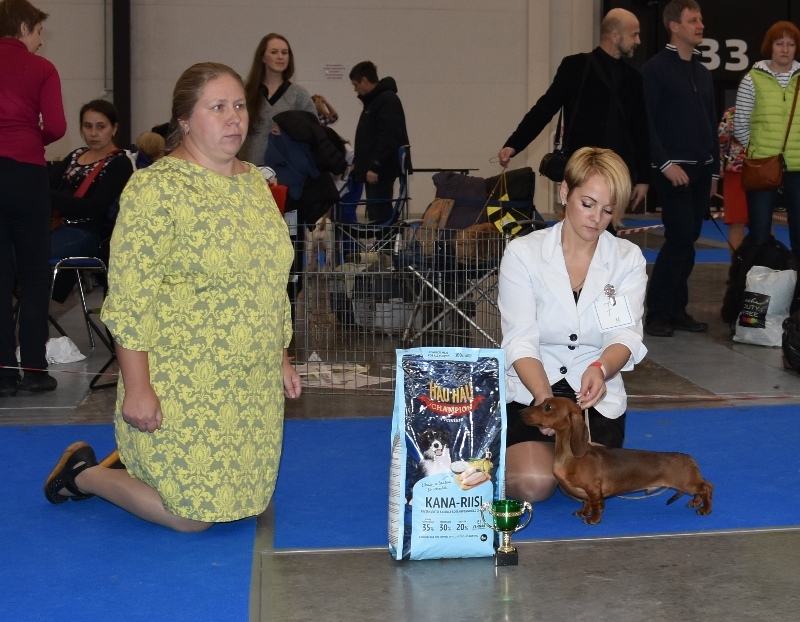 BEST IN SHOW Int. 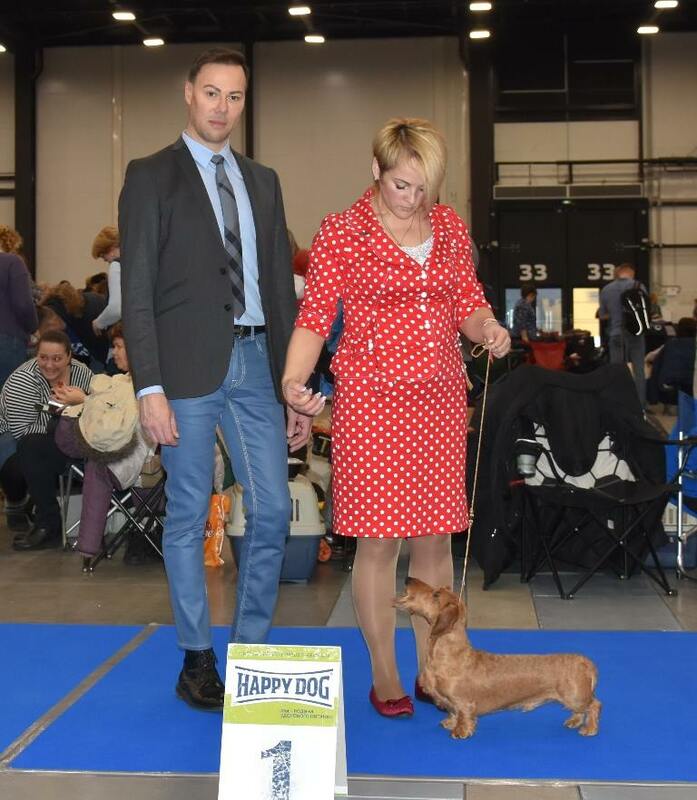 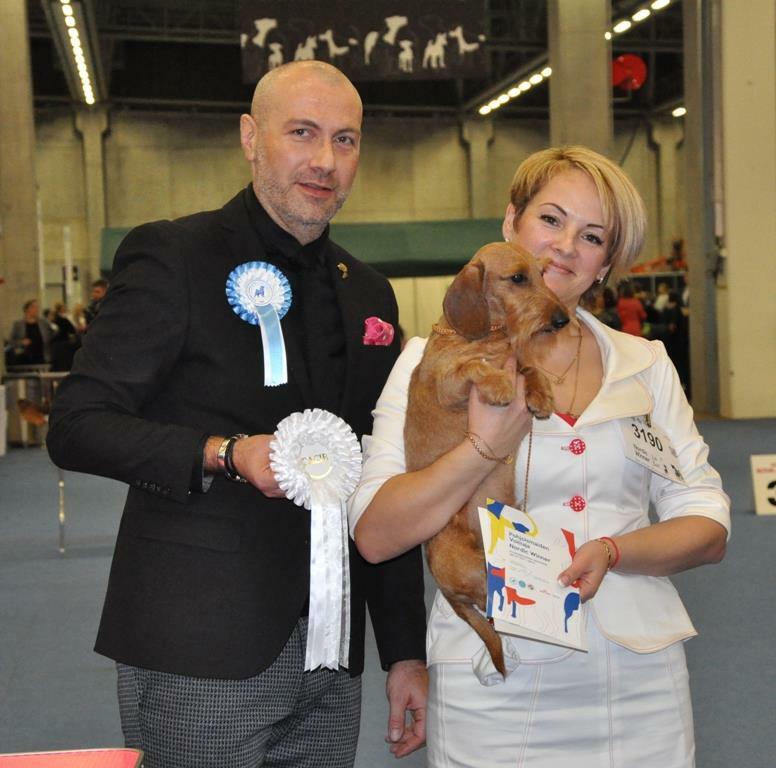 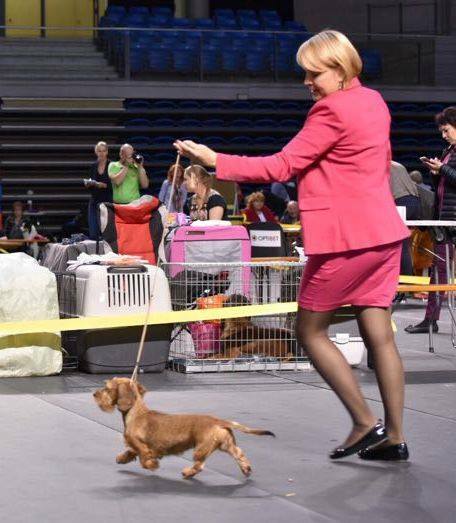 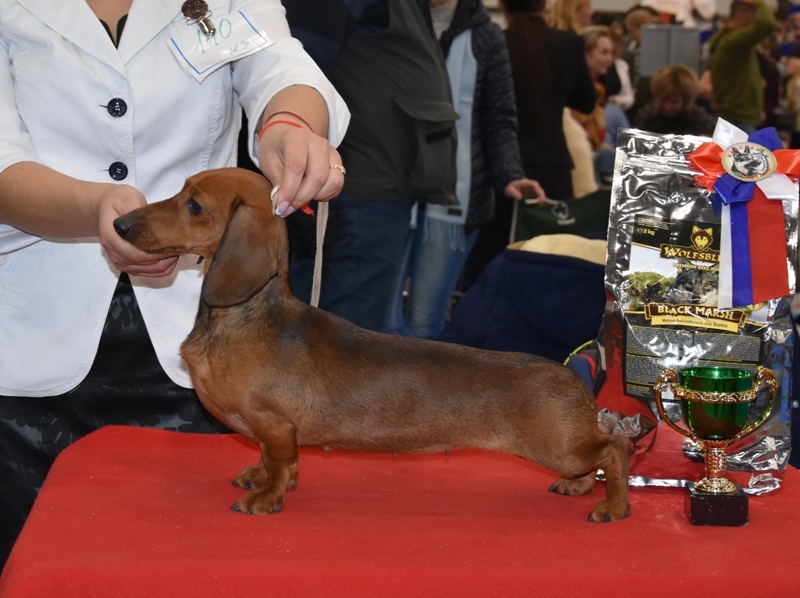 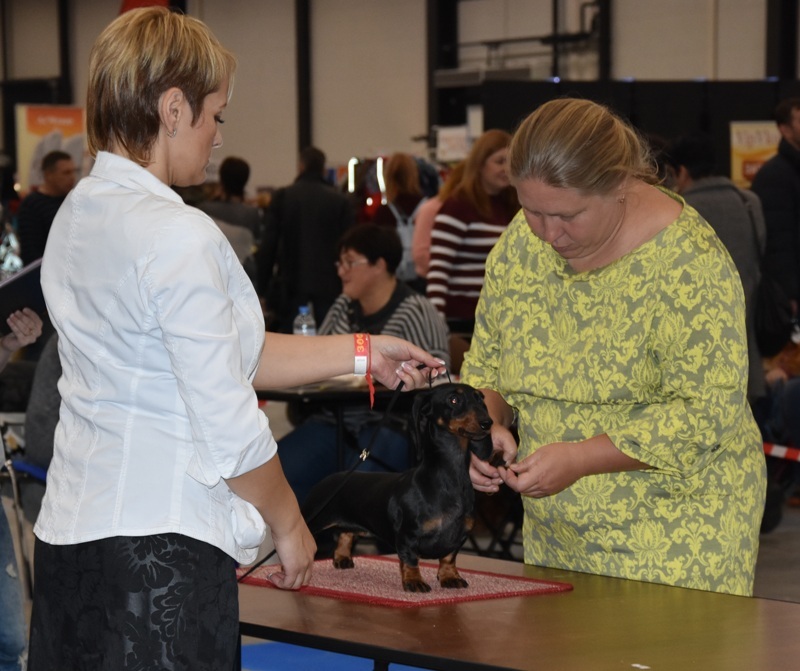 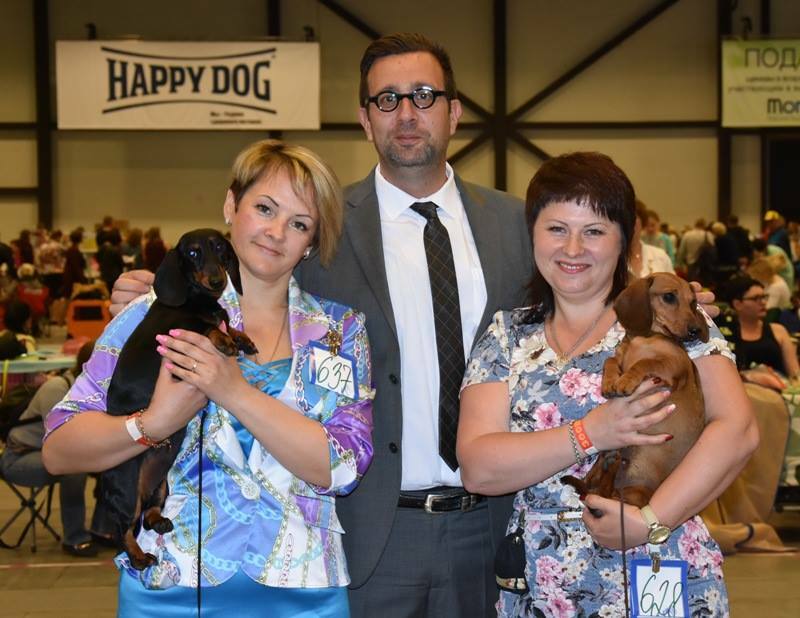 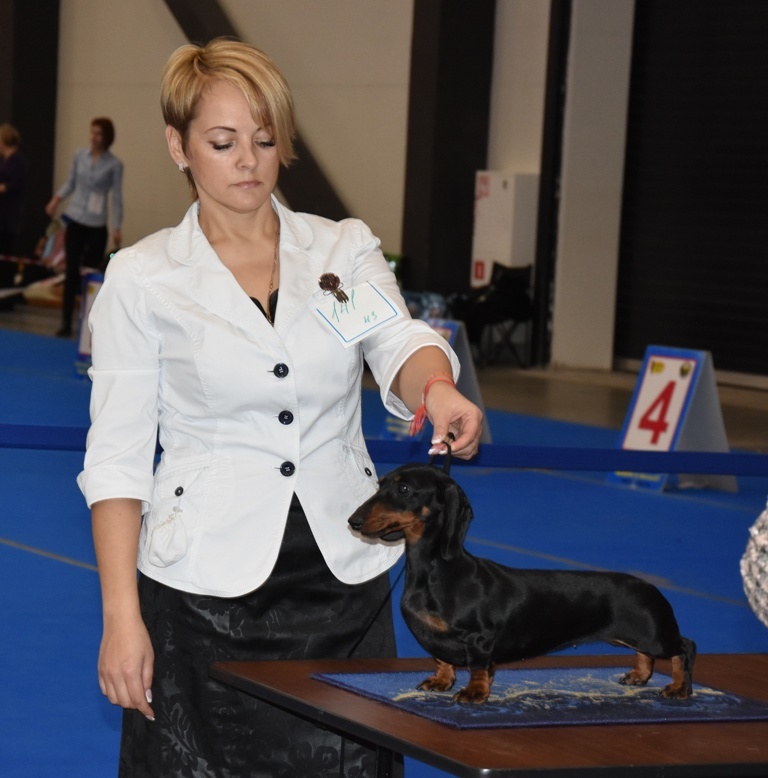 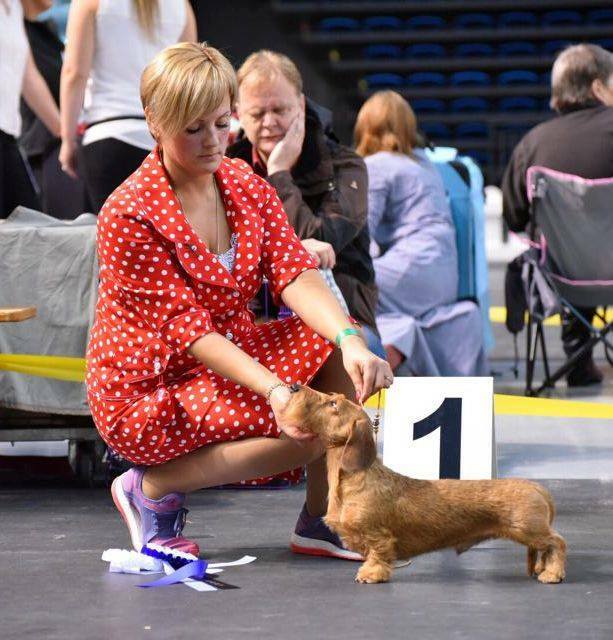 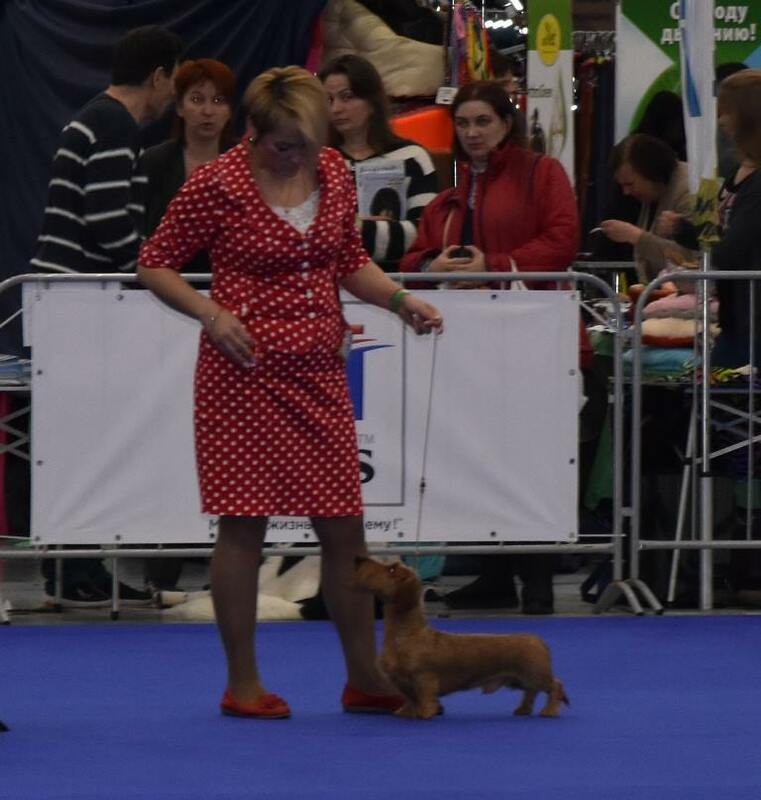 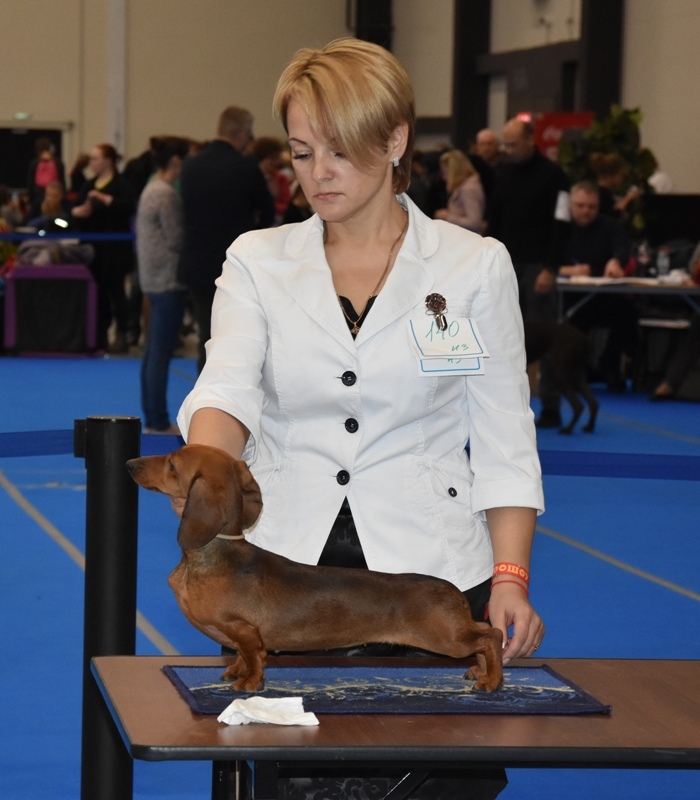 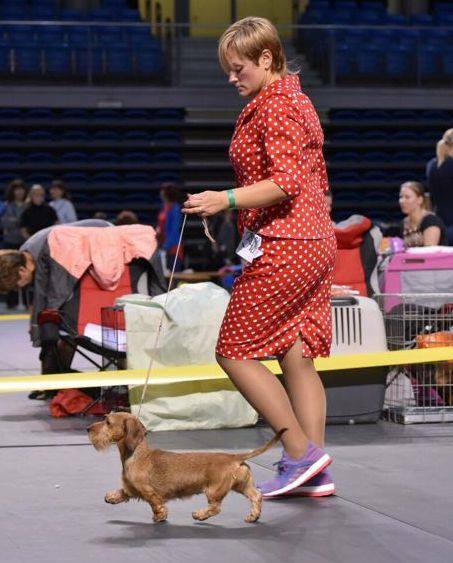 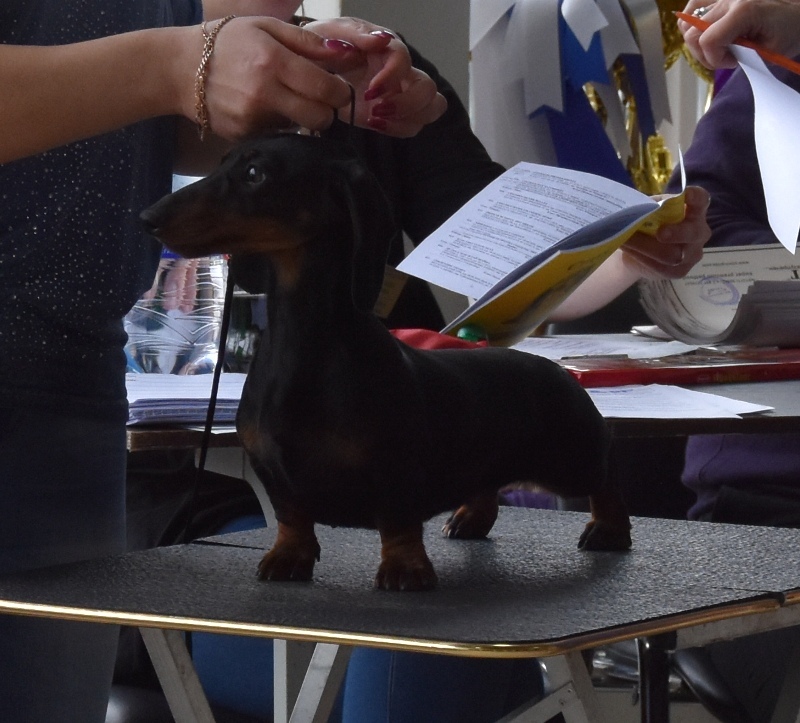 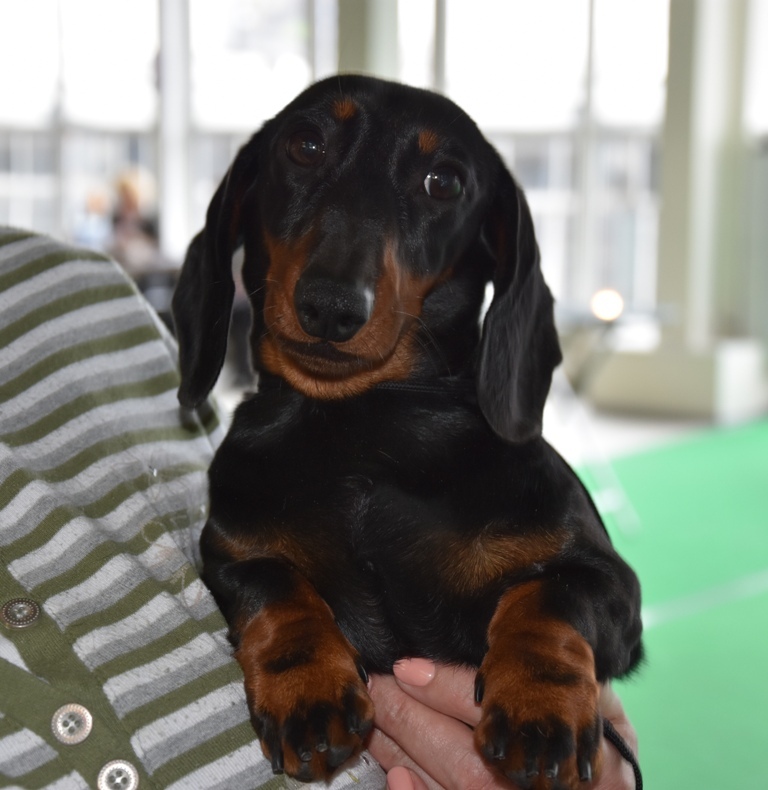 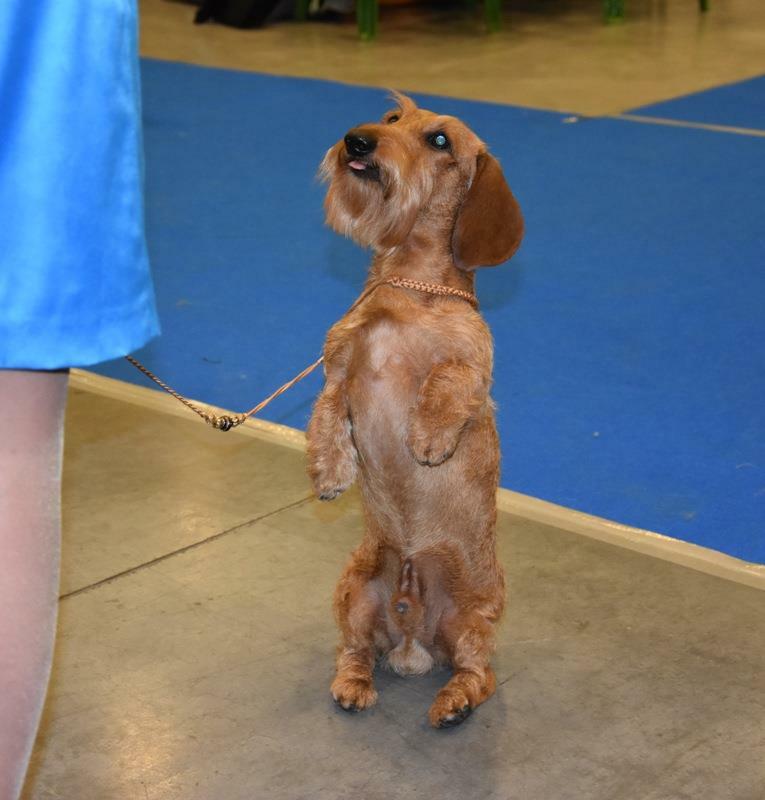 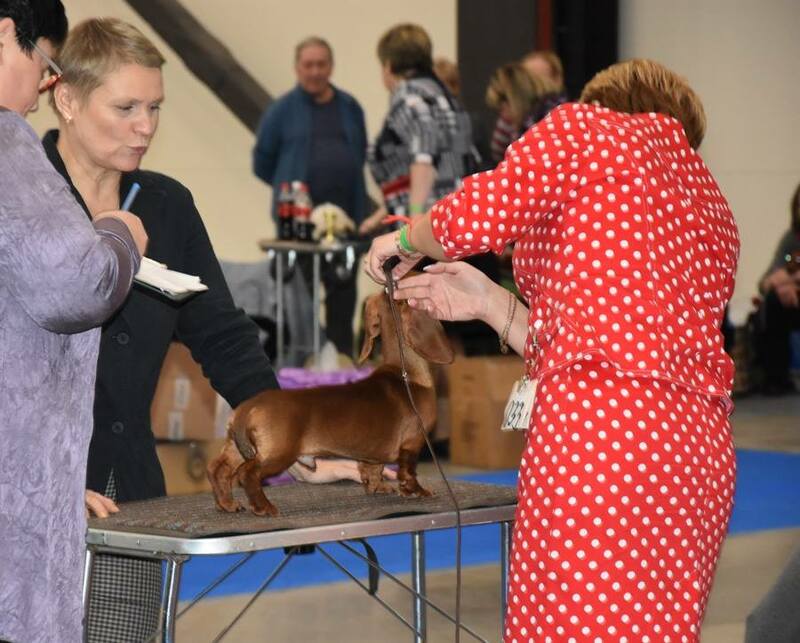 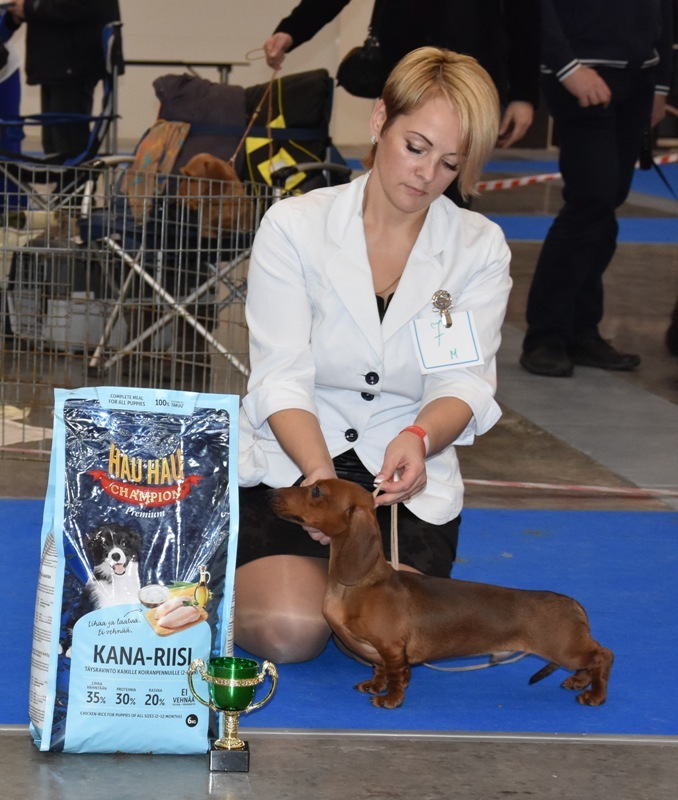 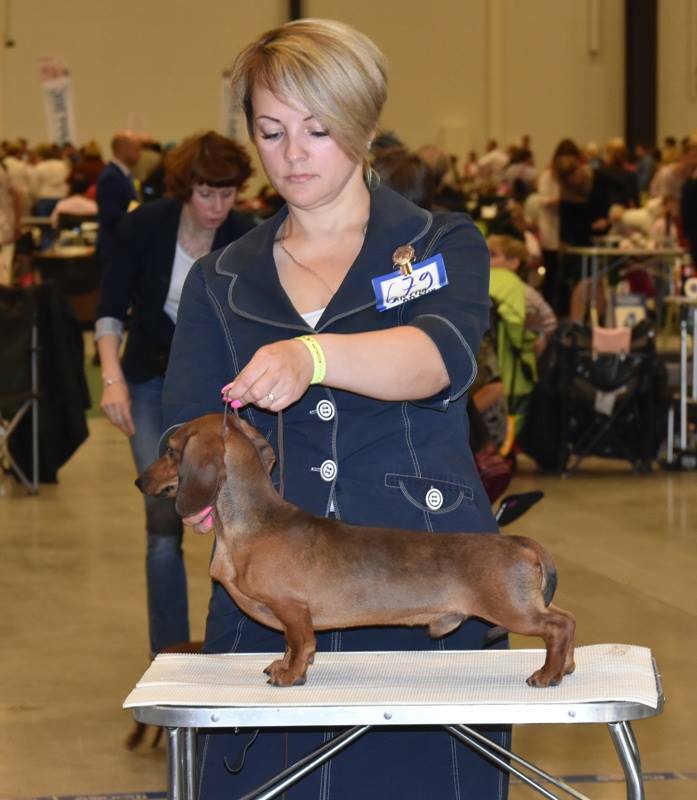 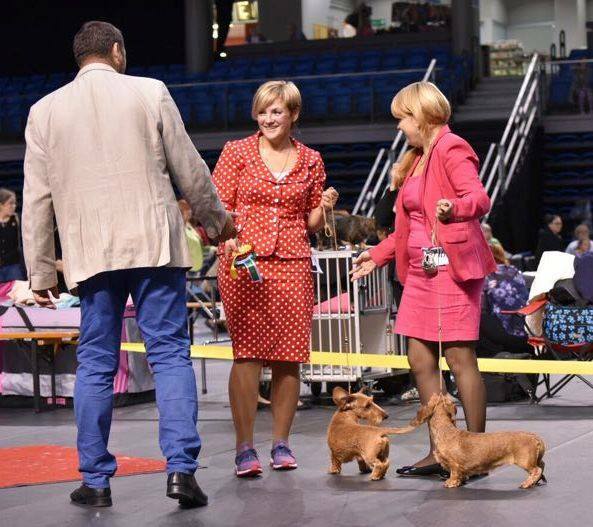 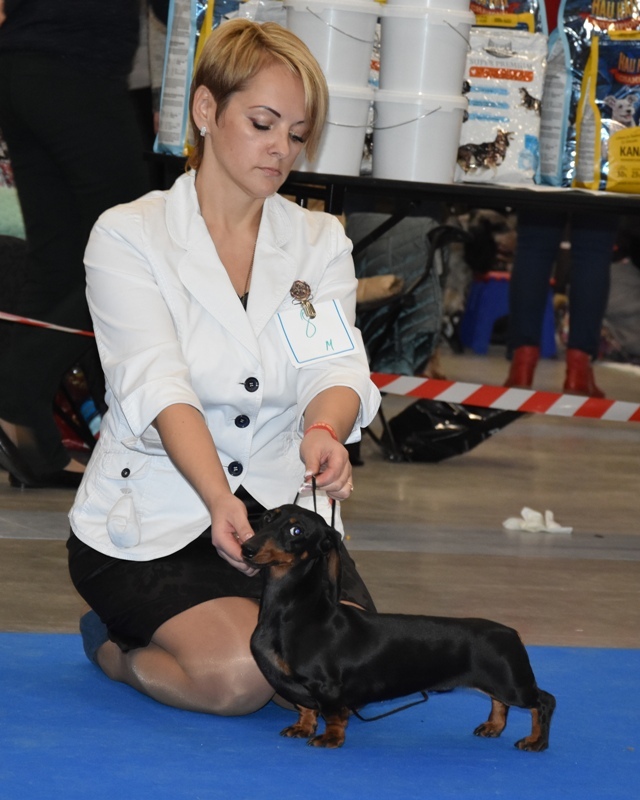 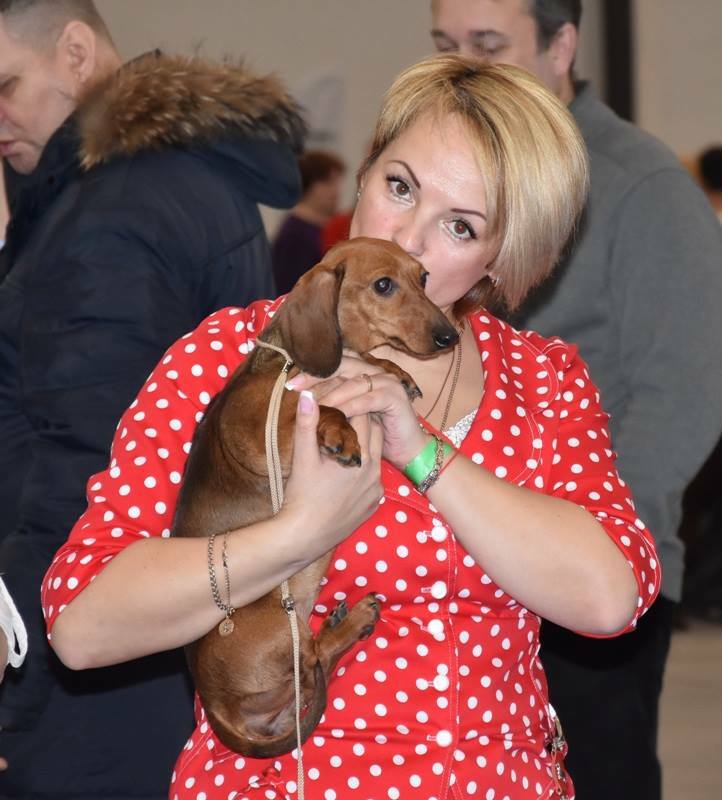 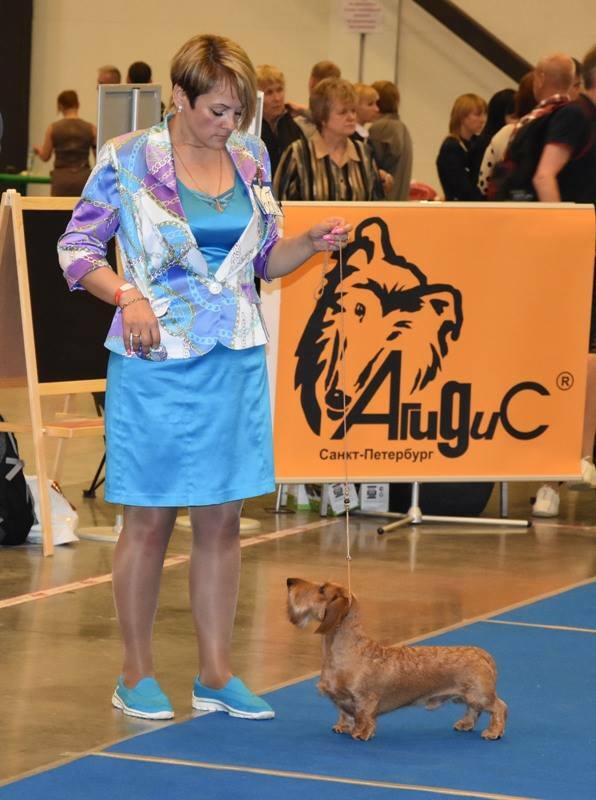 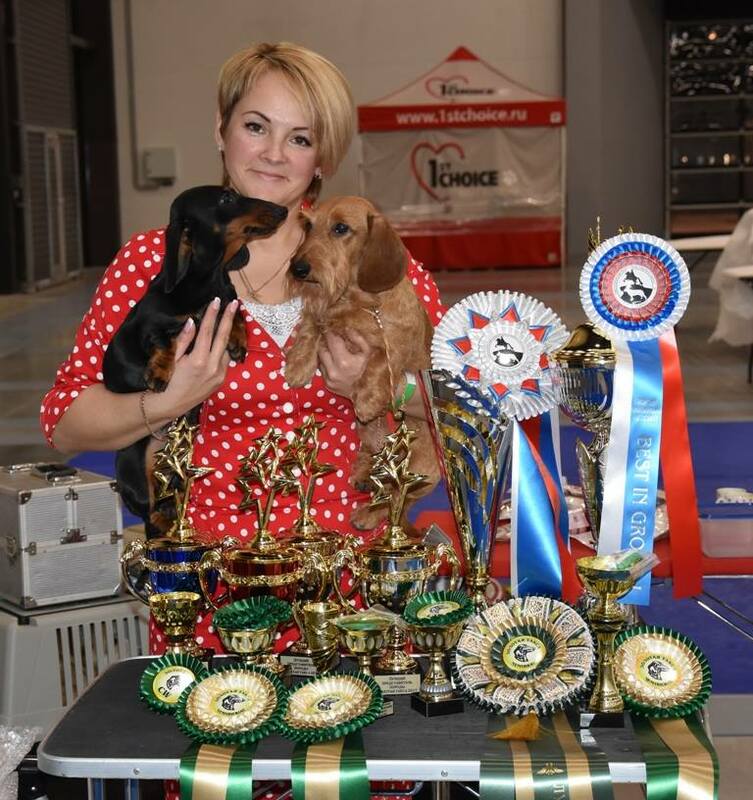 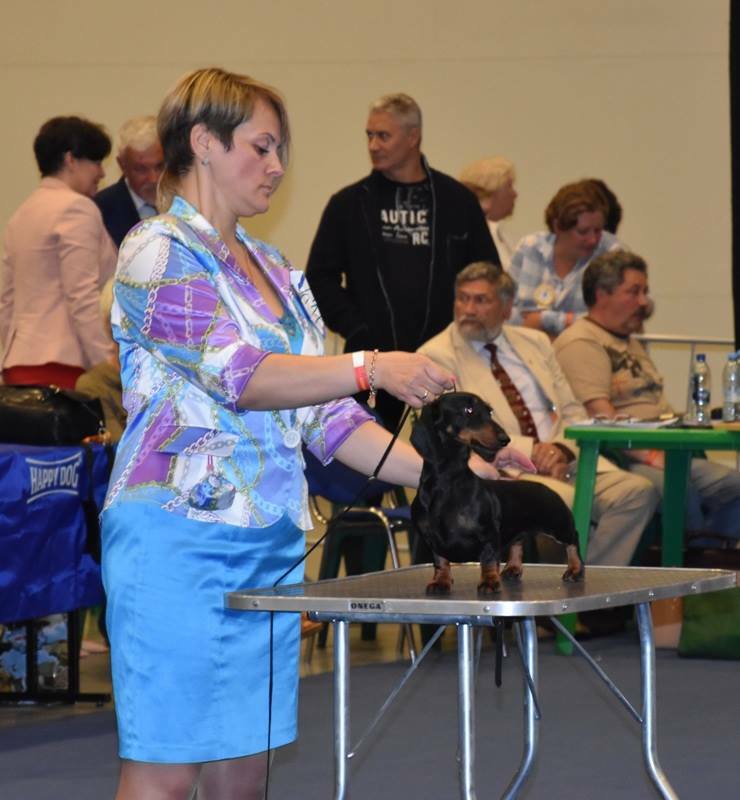 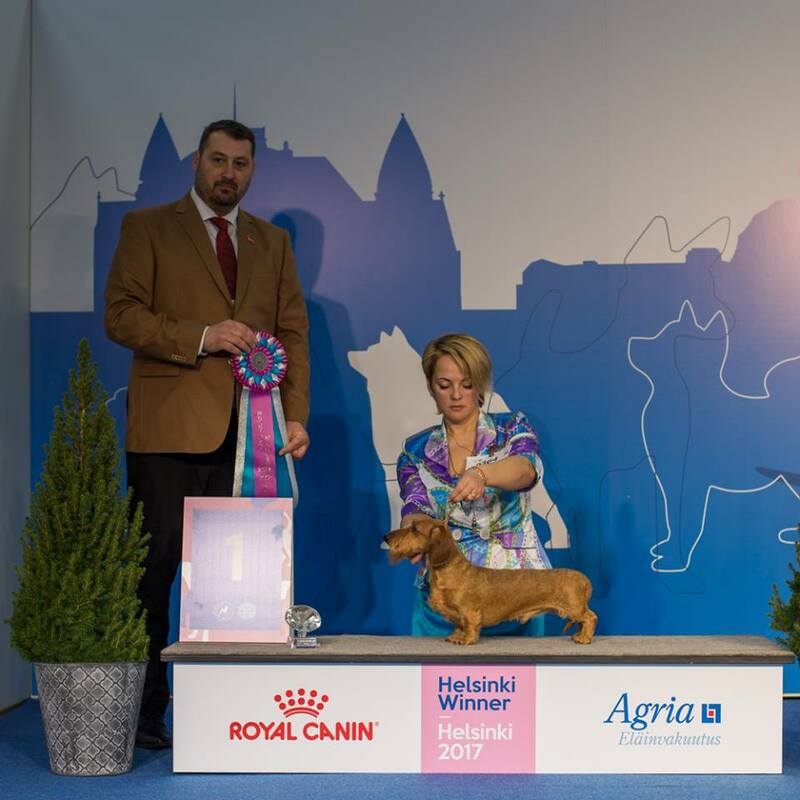 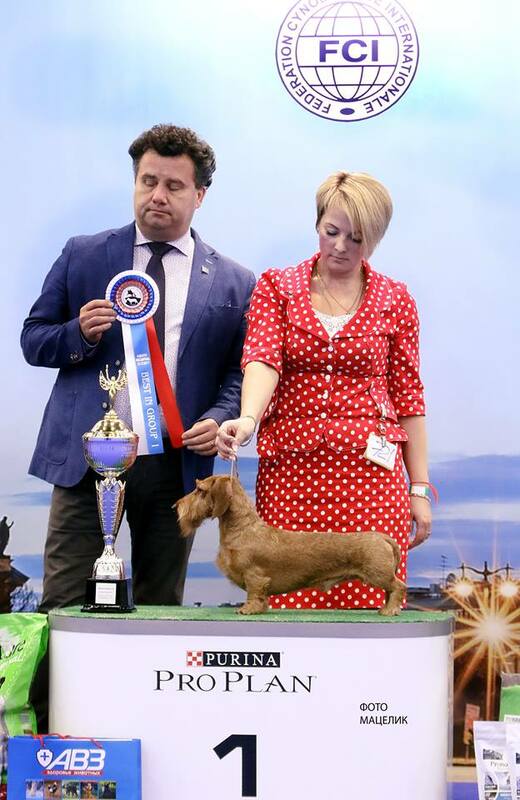 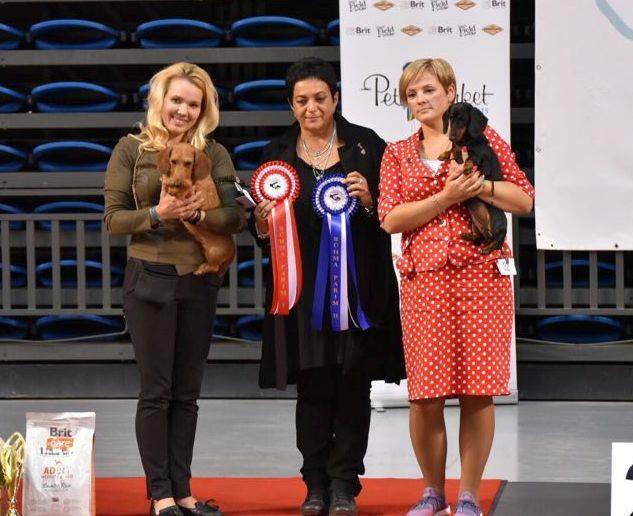 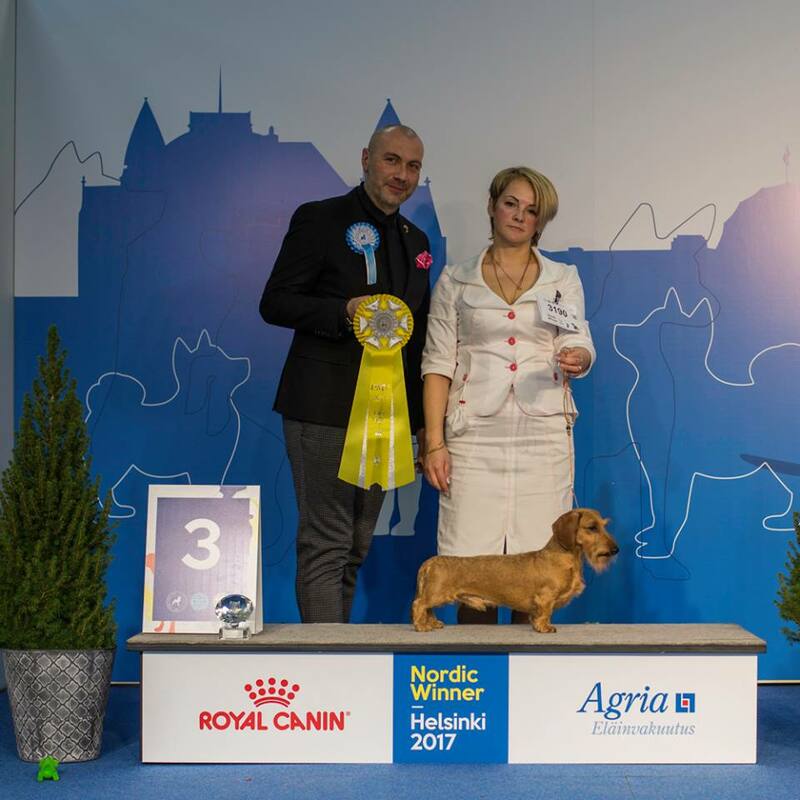 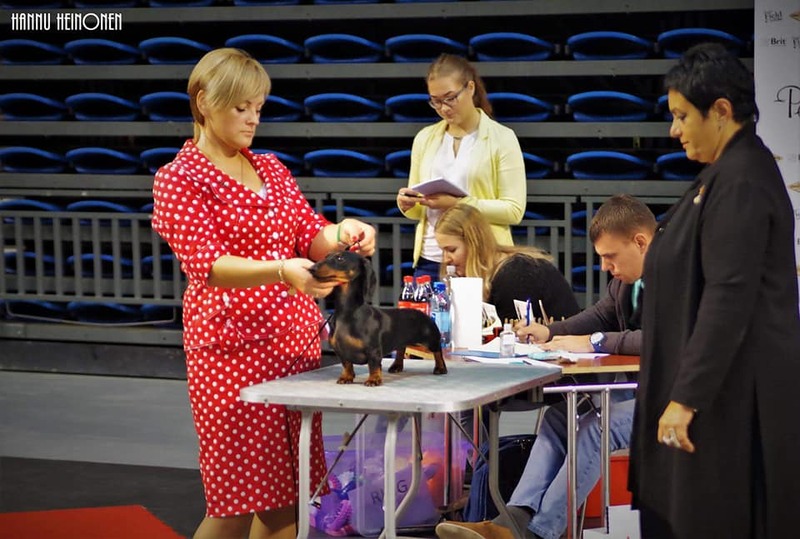 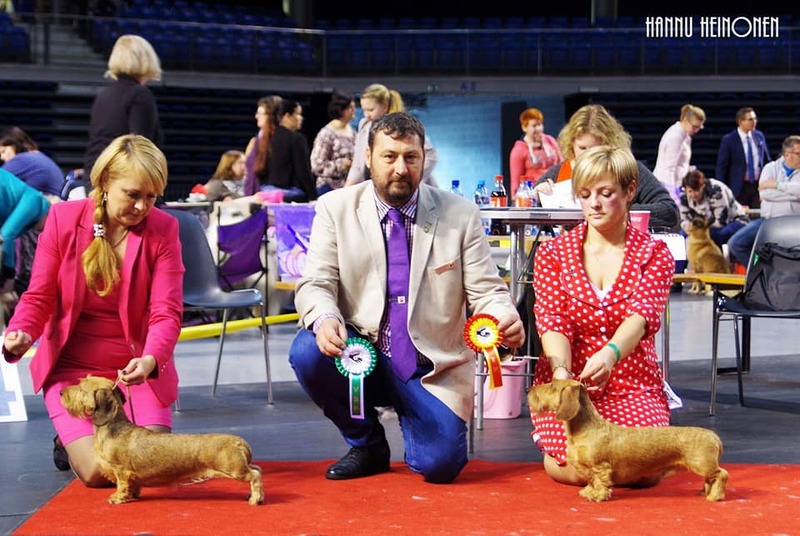 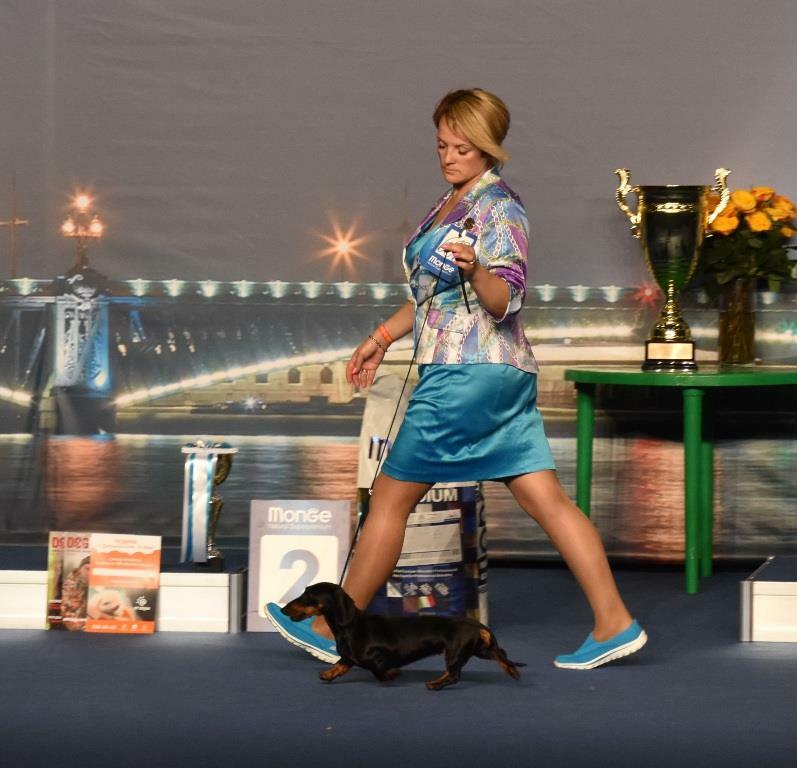 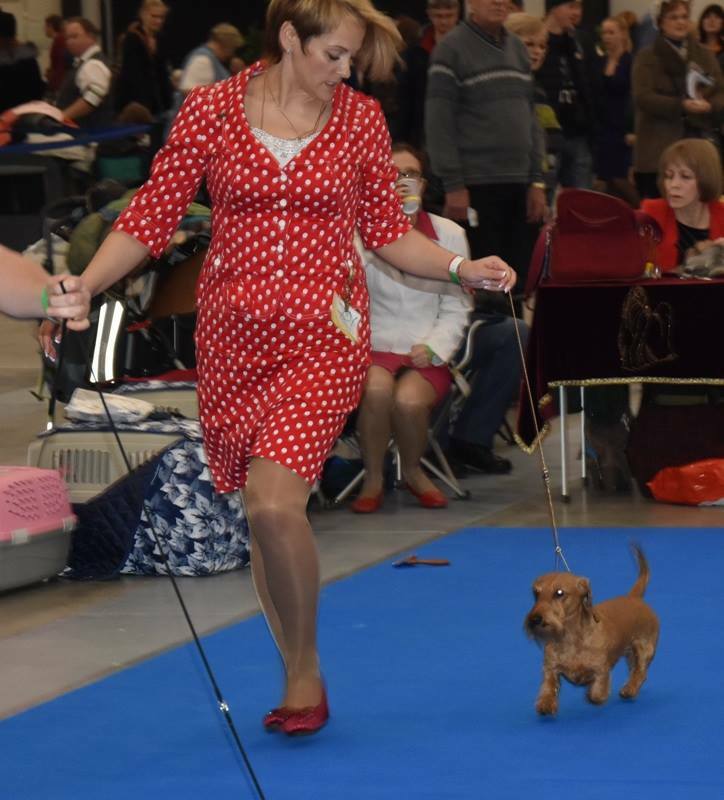 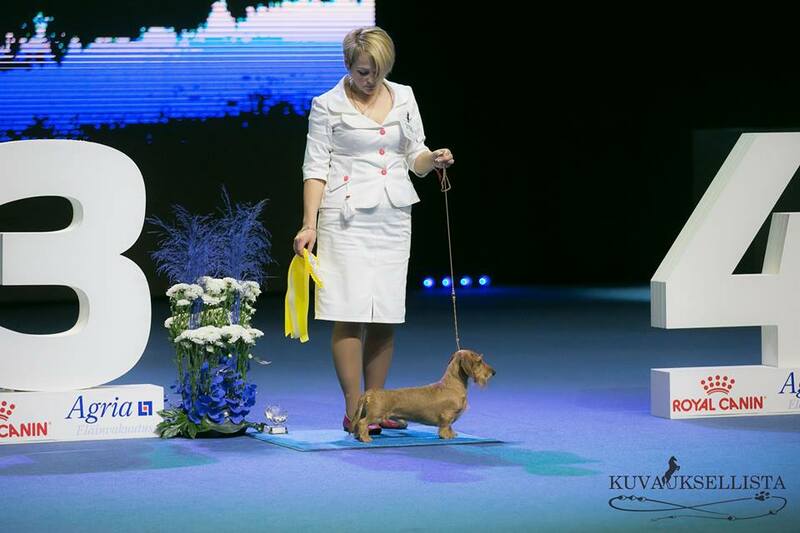 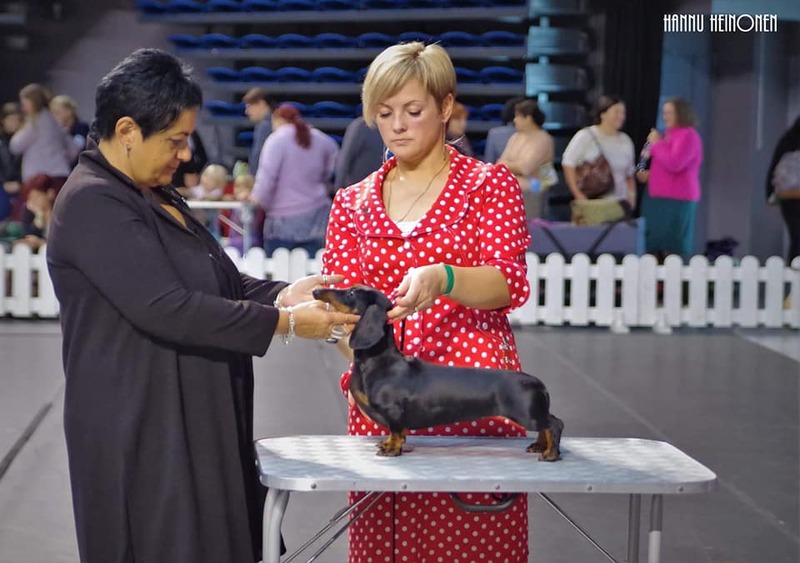 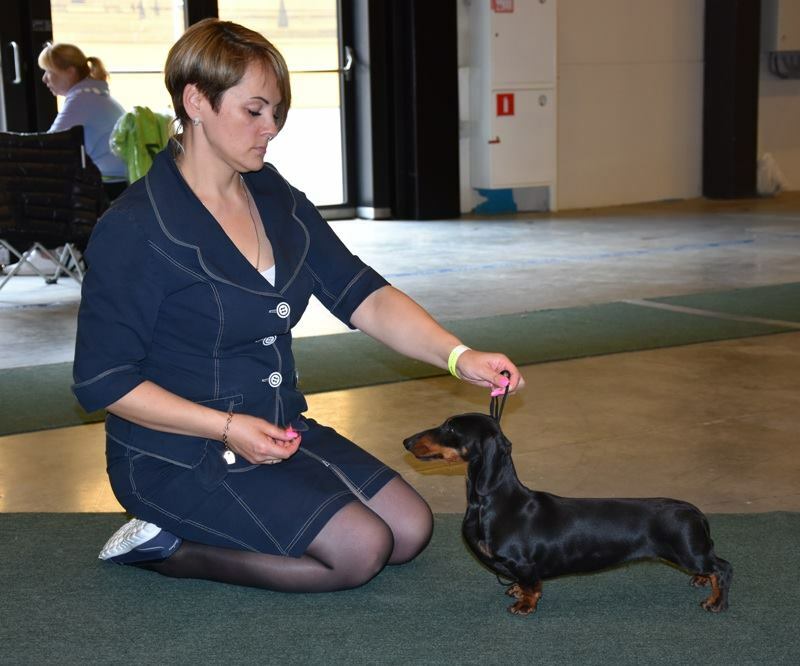 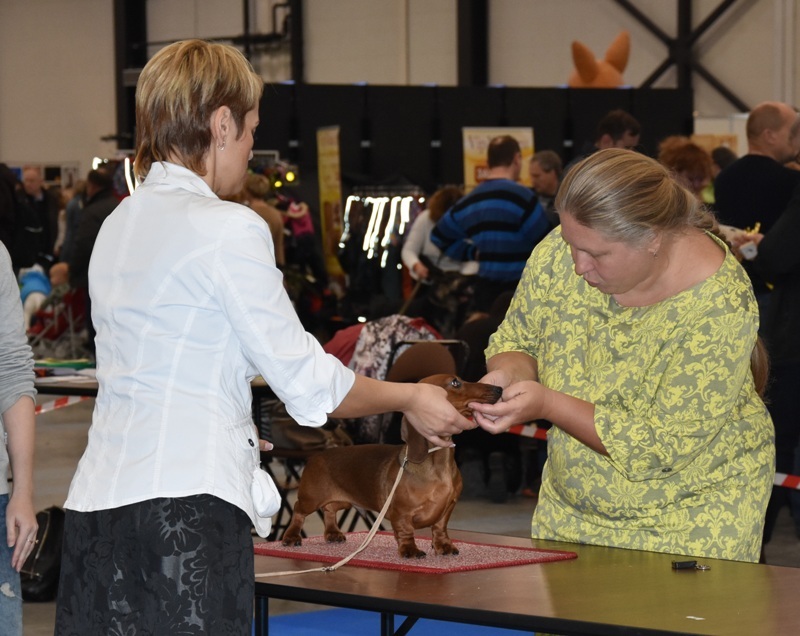 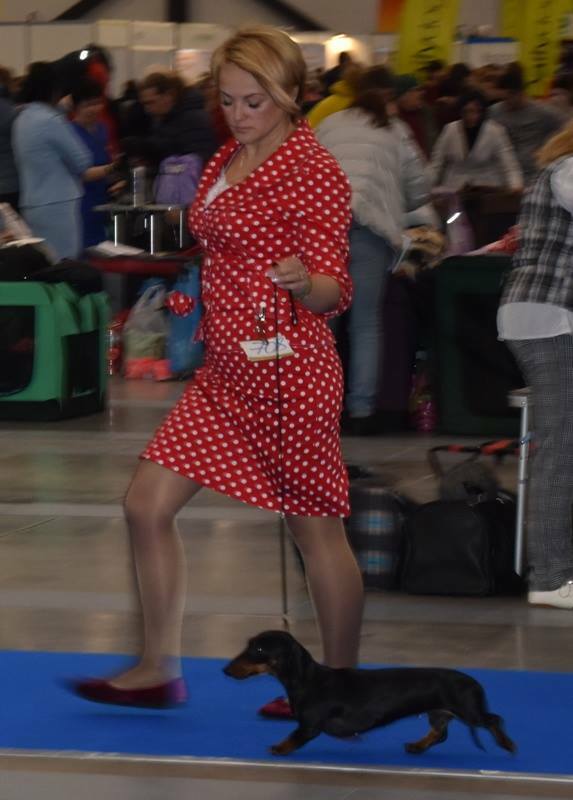 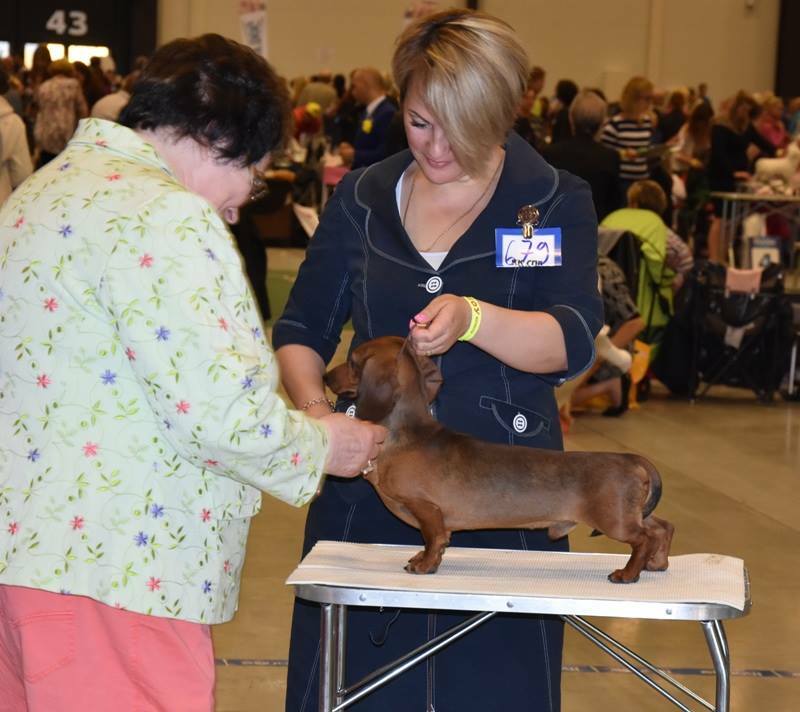 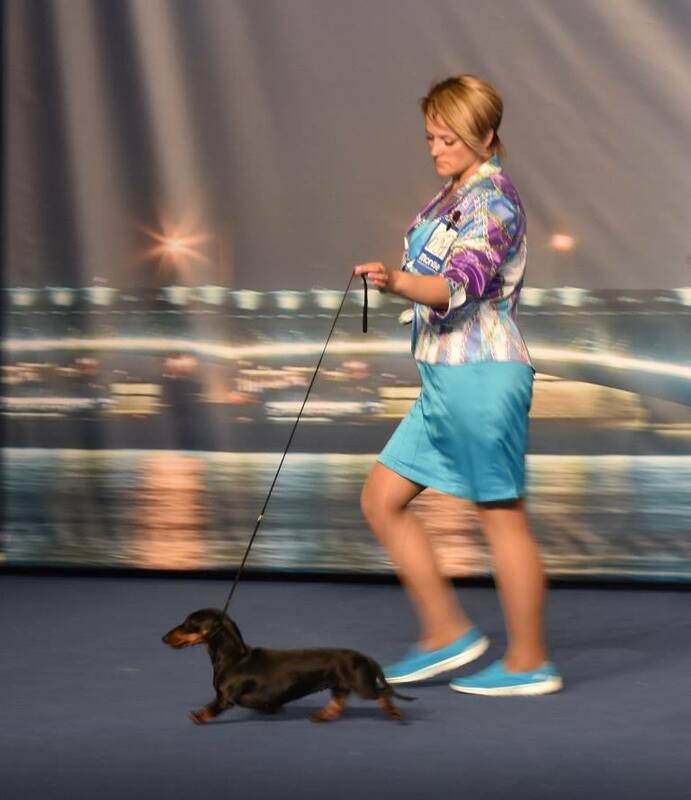 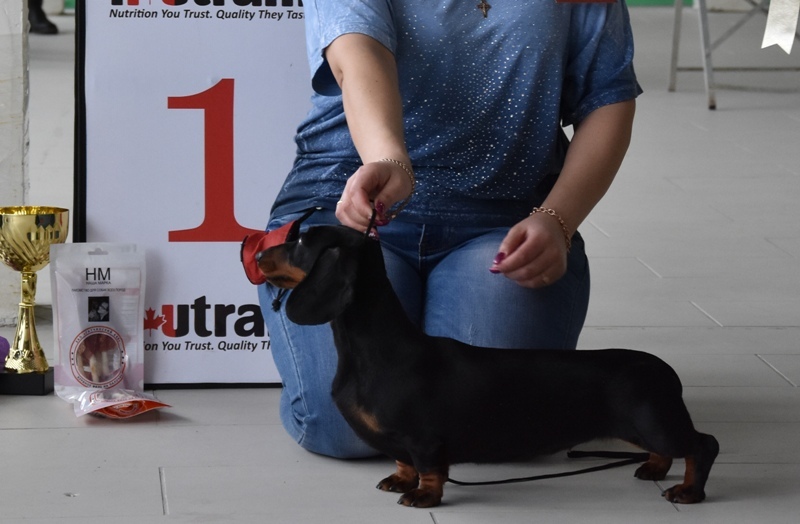 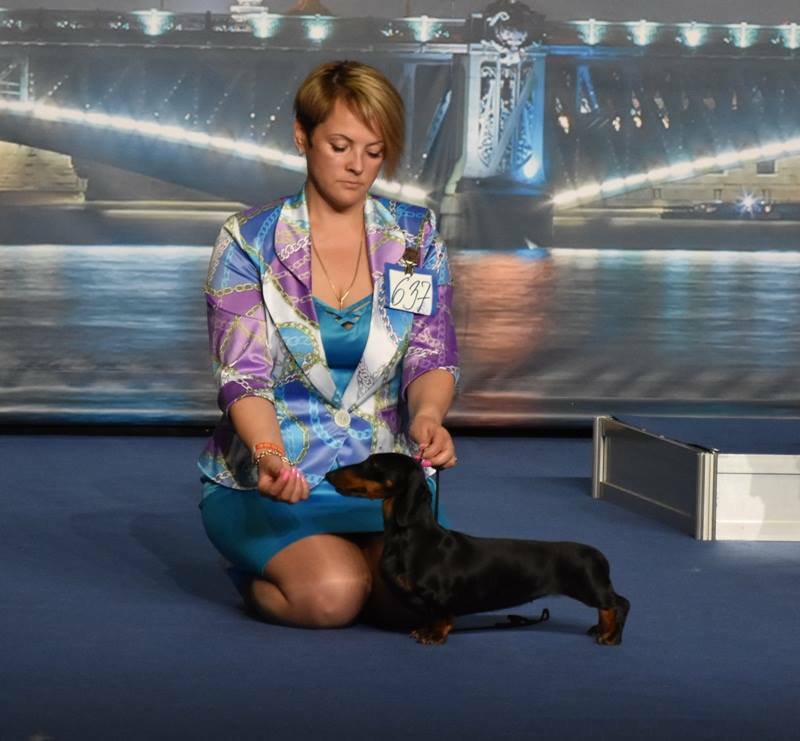 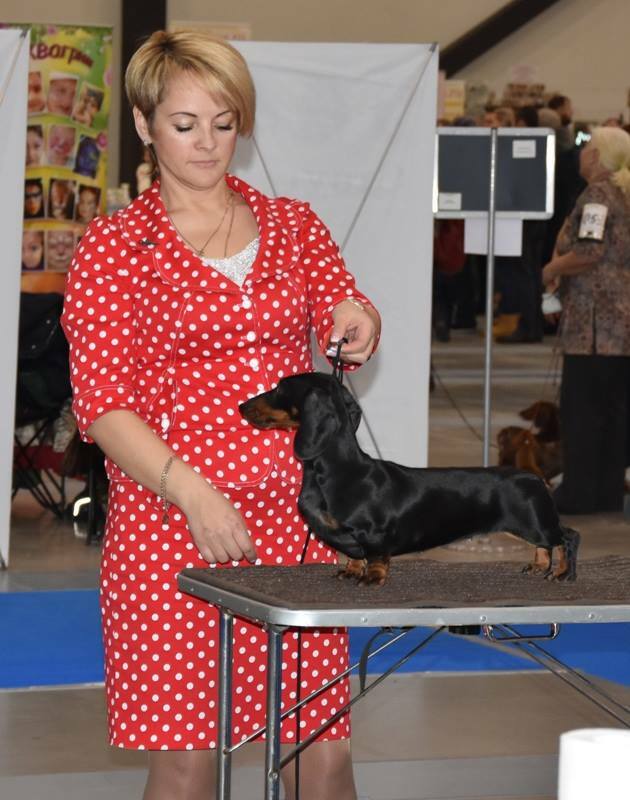 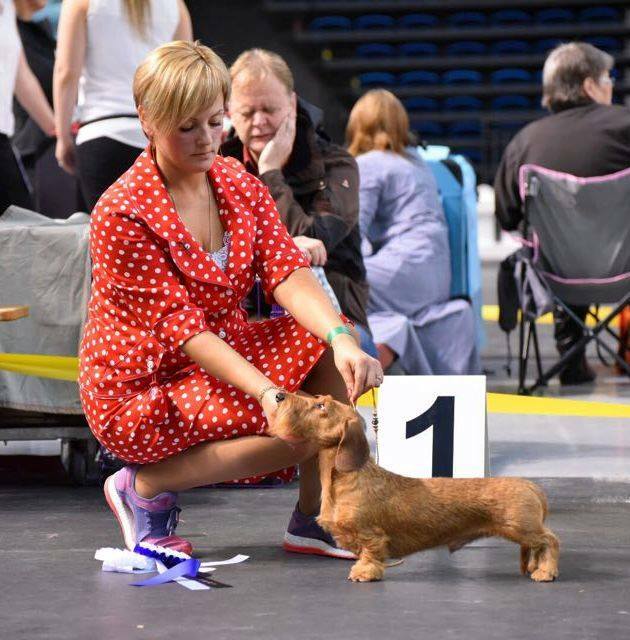 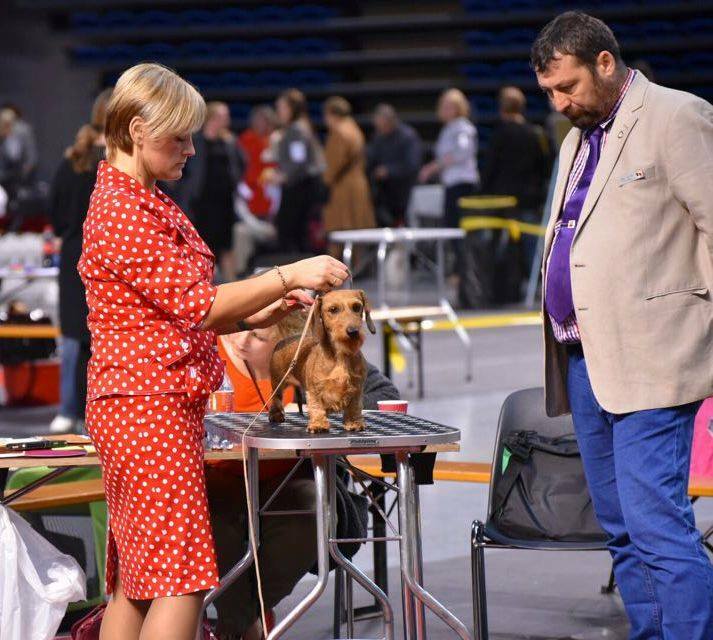 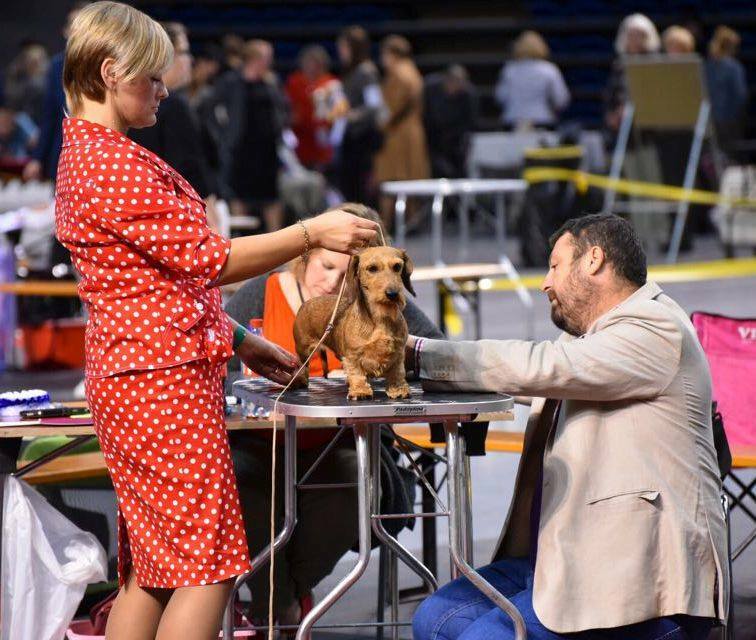 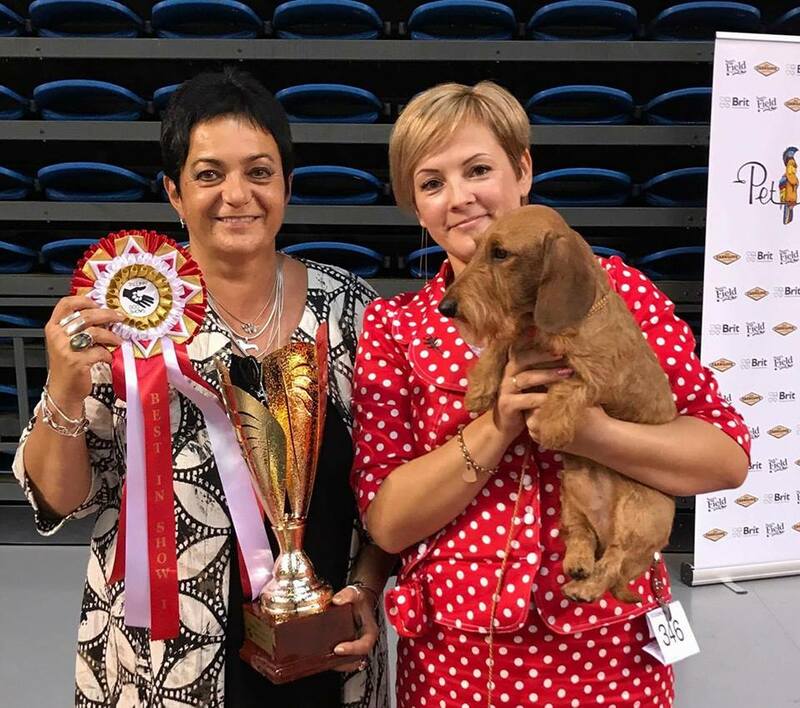 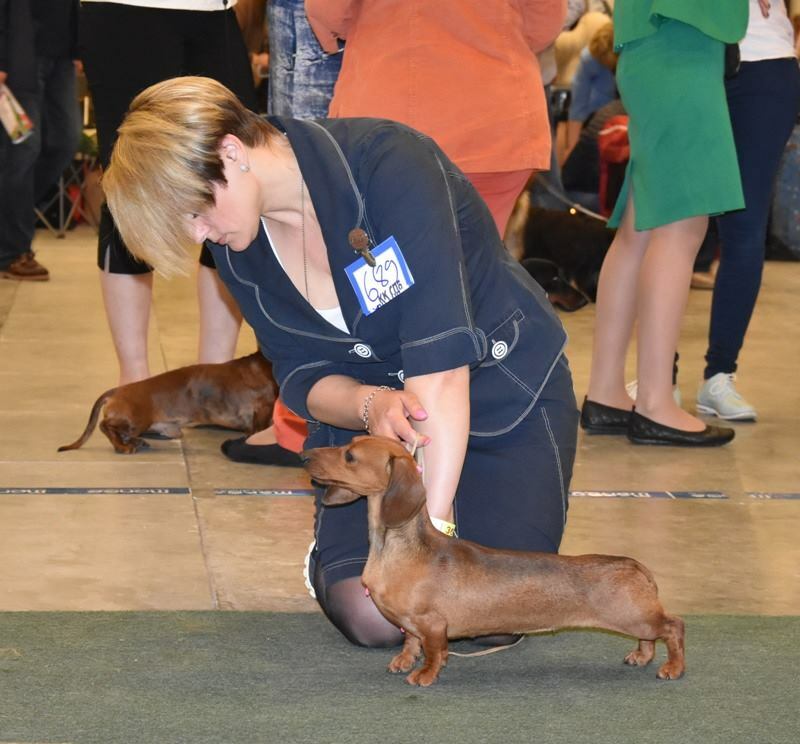 "Newsky Winner-2017" and BISS-1 Special Championship "Gold Dachshund-2017" - Magik Rainbow Verino Roberto Gold MW!!! 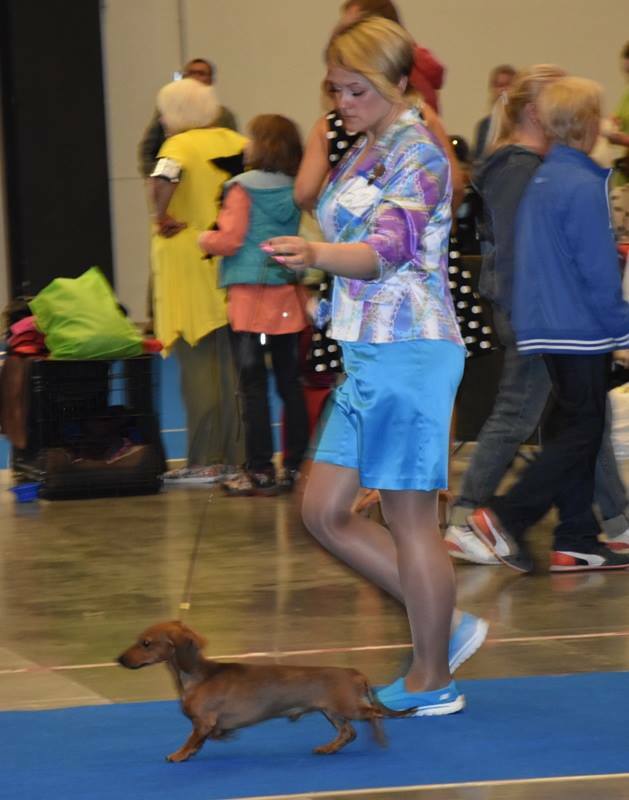 Magik Rainbow Total Look MS - BISS Puppy -1! 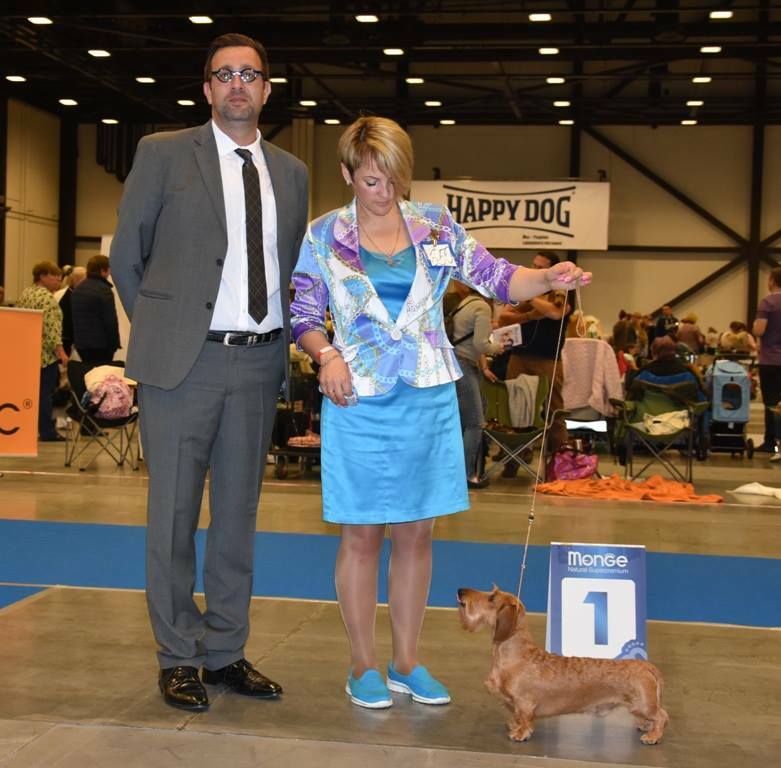 Magik Rainbow Konstance - Winner Club & BOB! 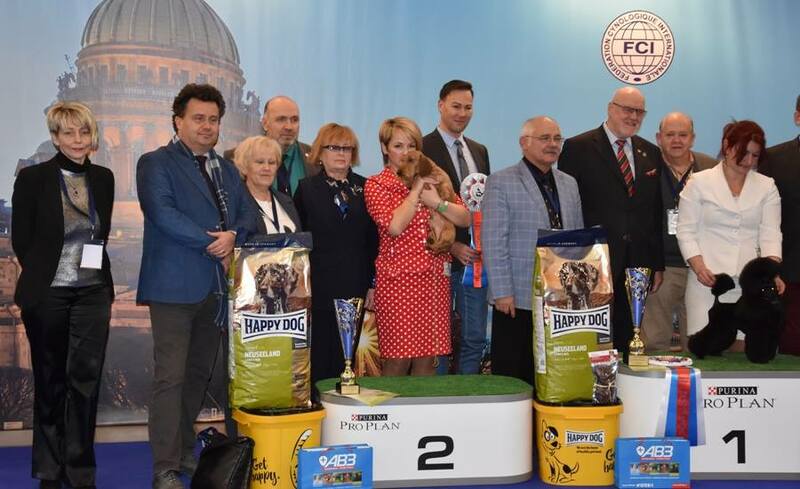 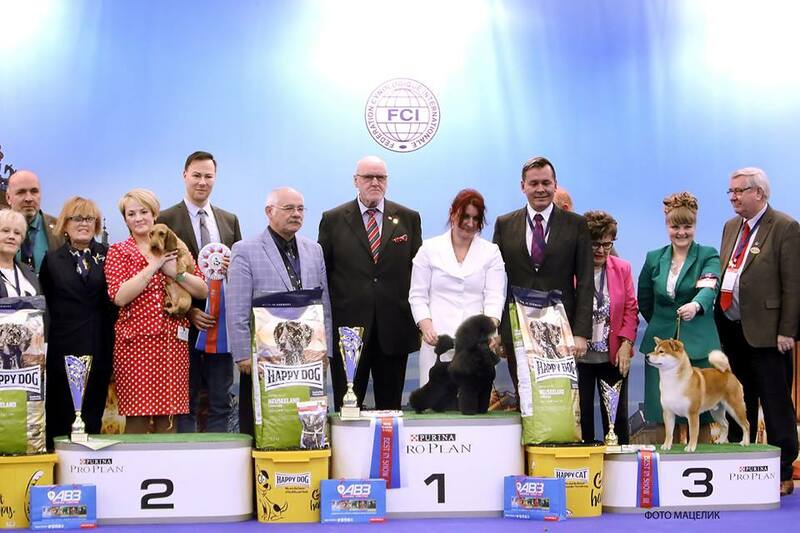 BIS-1, BOG-1, BOB, Helsinki Winner-2017, CACIB - Magik Rainbow Verino Roberto Gold MW!!! 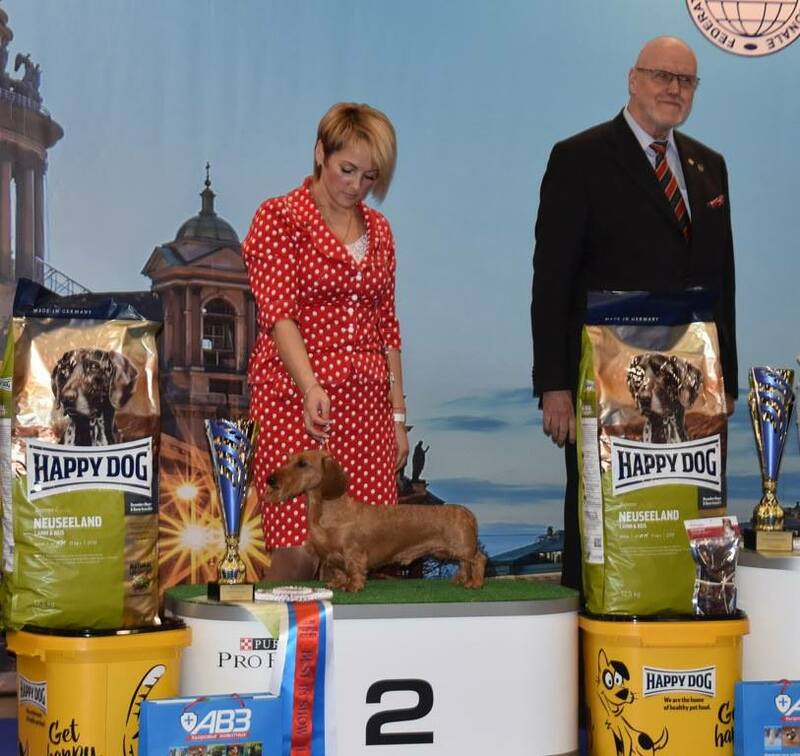 BOG-3, BOB, Nordic Winner-2017, CACIB - Magik Rainbow Verino Roberto Gold MW!!! 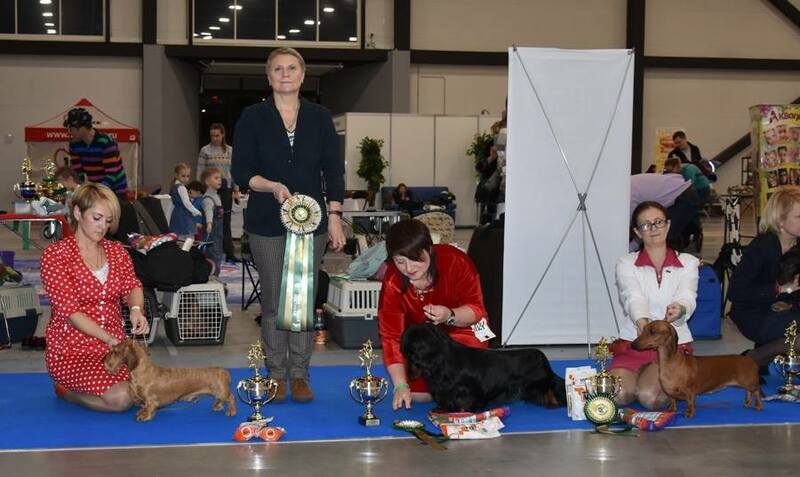 BOG-2, BOB, Finish Winner-2017, CACIB - Magik Rainbow Verino Roberto Gold MW!!! 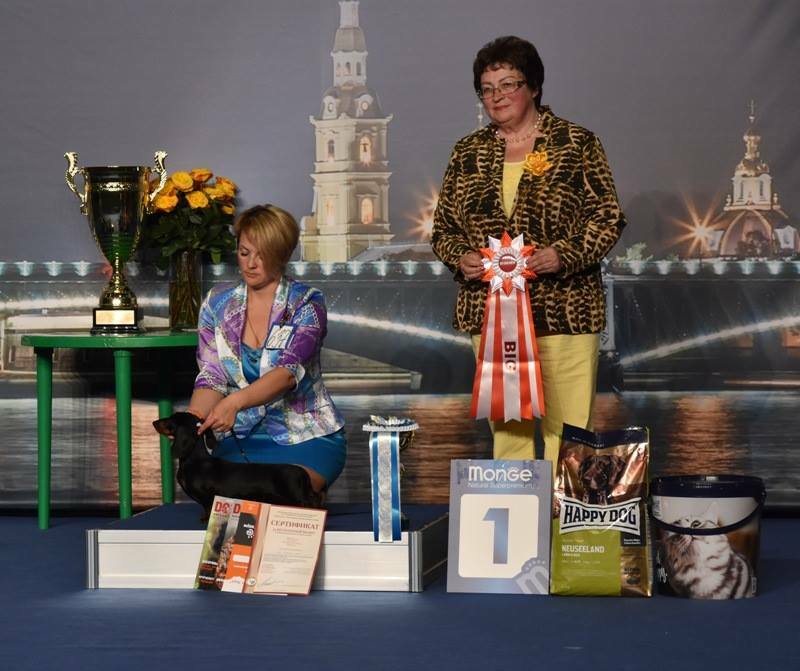 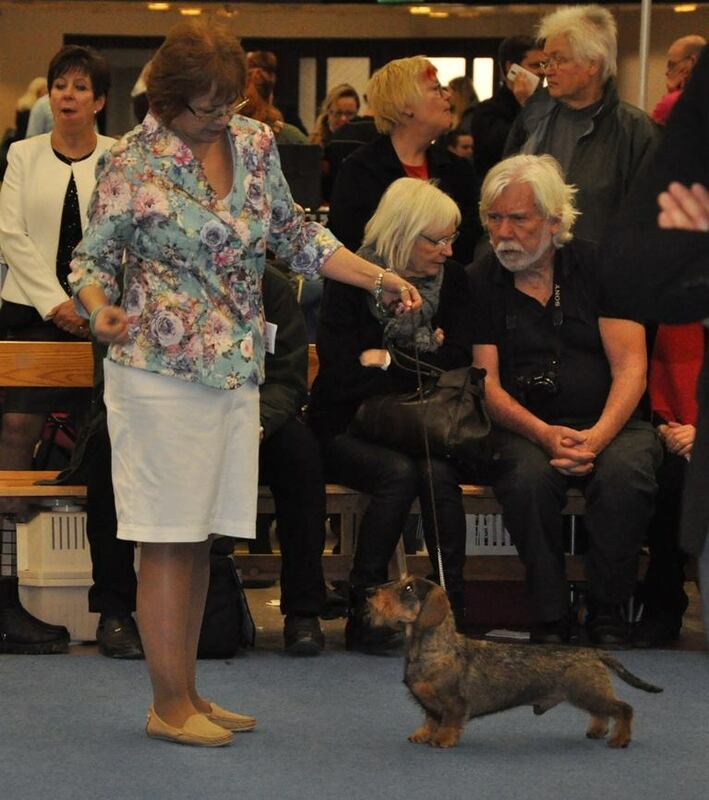 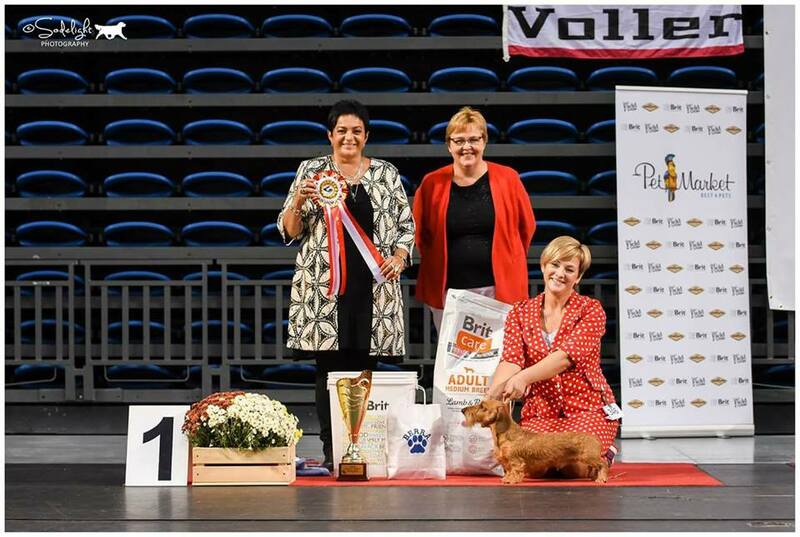 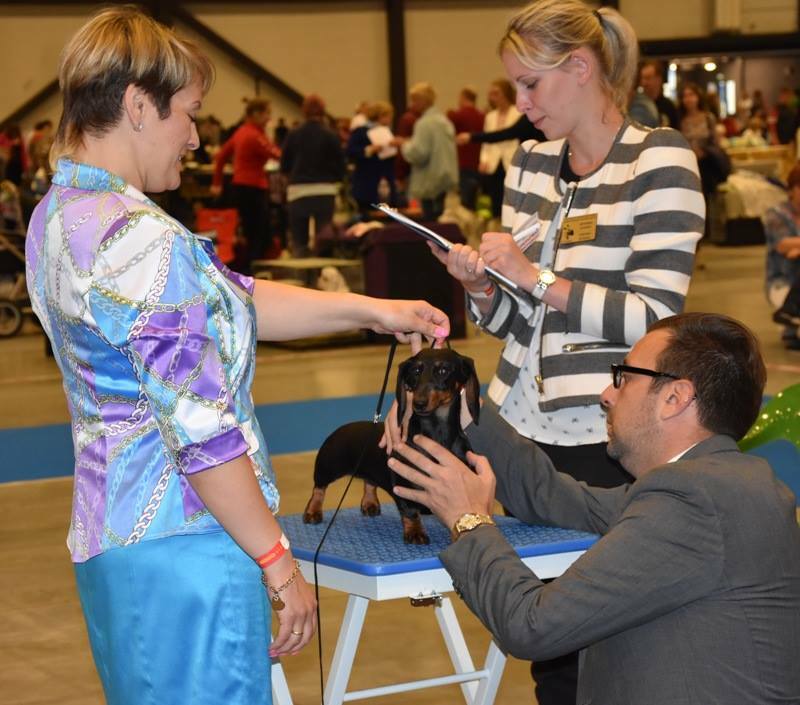 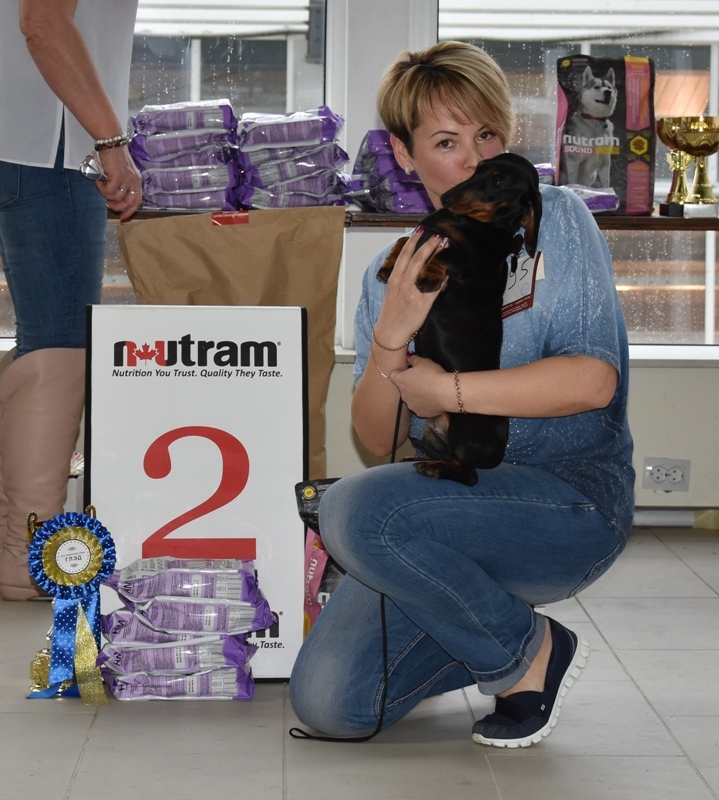 All three days the Best Veteran of Breed - Magik Rainbow Brabus MW! 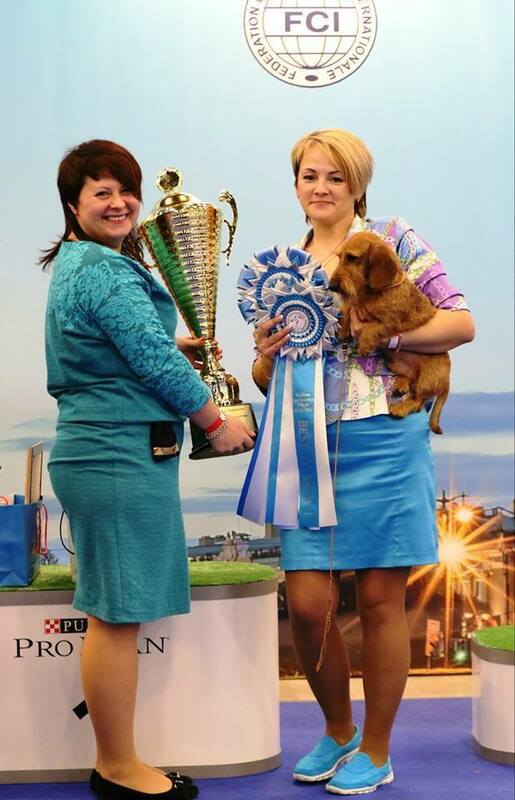 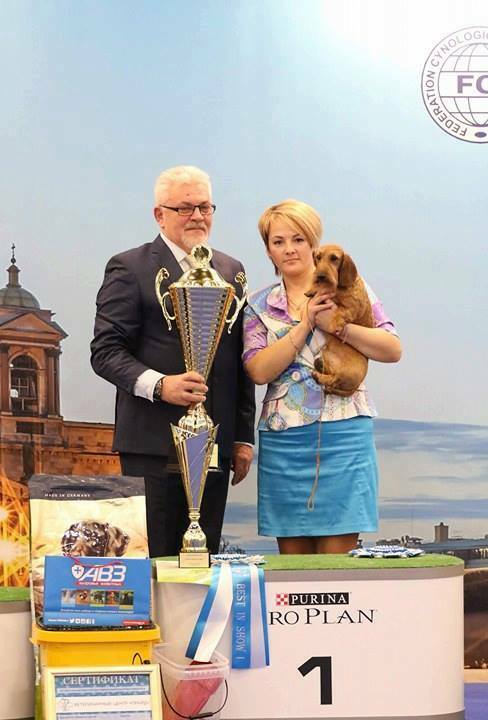 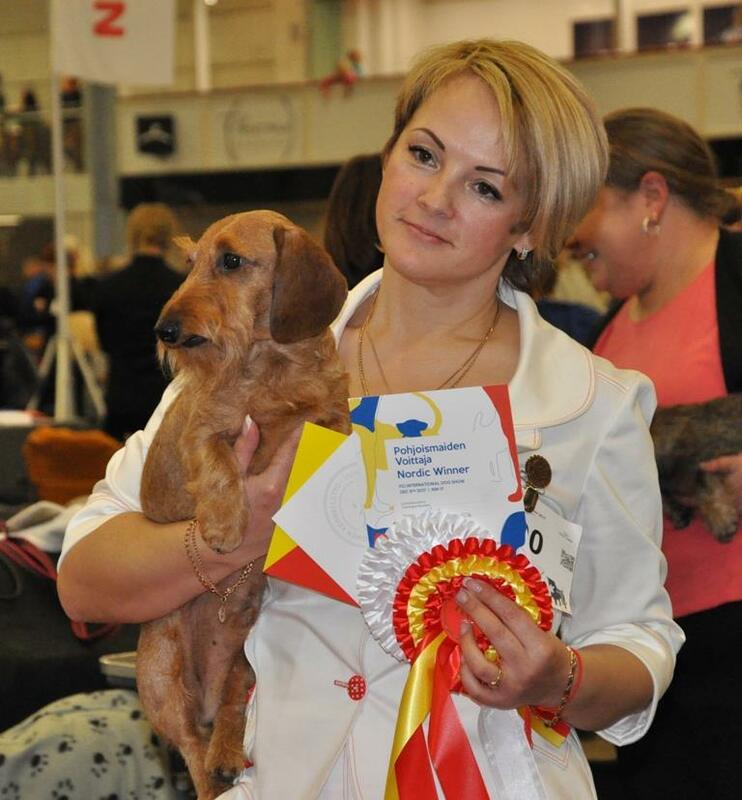 Congratulations to his owner Elena Grishina! 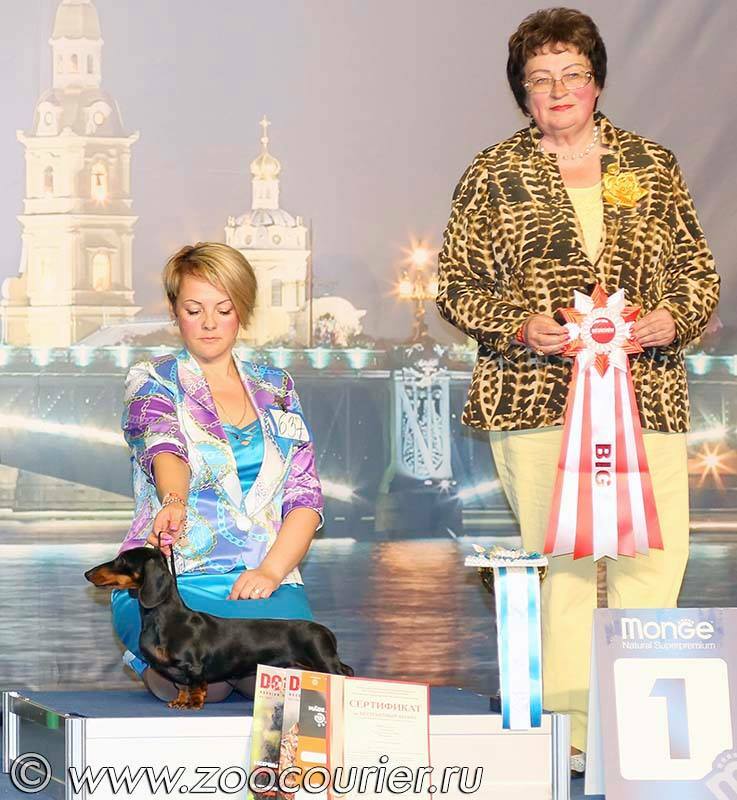 Magik Rainbow Tesoro MS - BOBPuppy & BISSP-1! 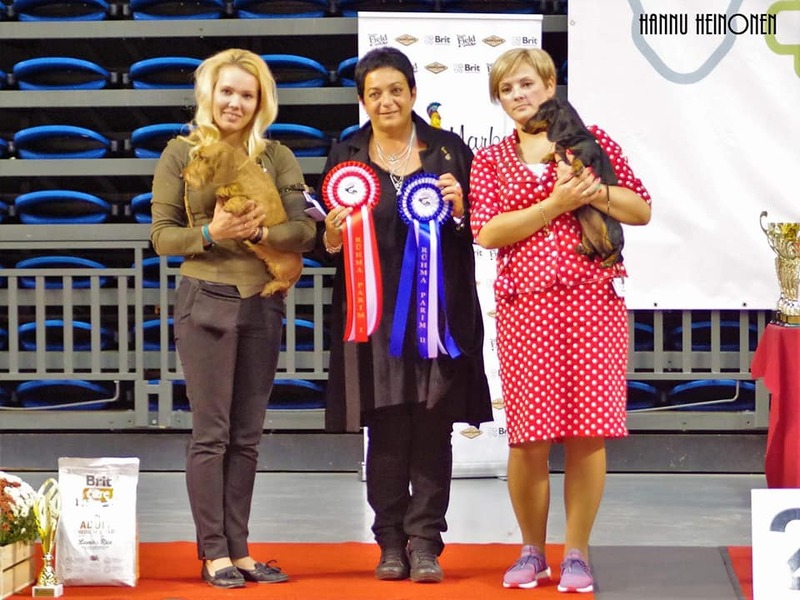 Magik Rainbow Verino Roberto Gold MW - BOB & BISS-1! 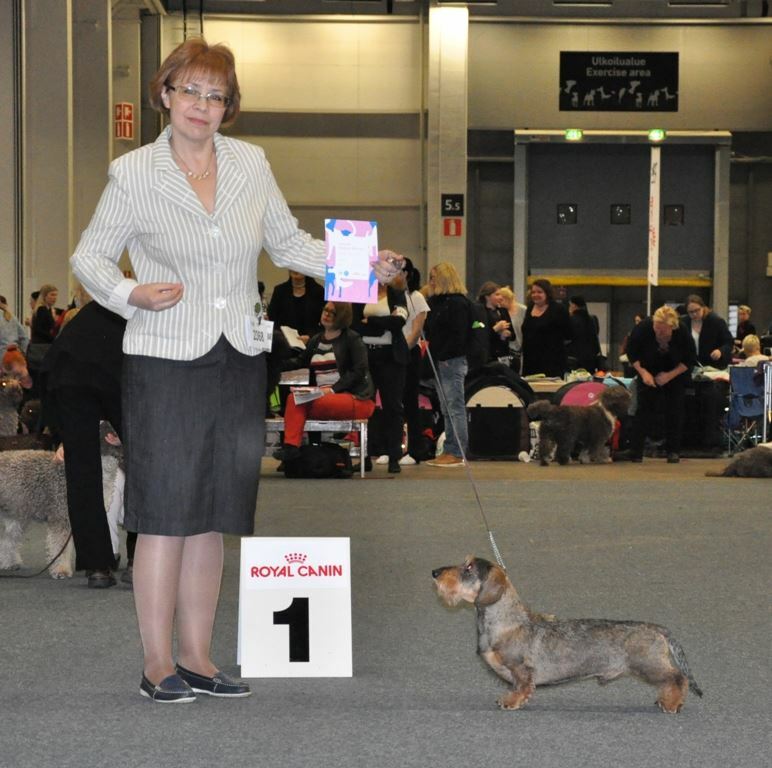 Magik Rainbow Konstance - CAC Club & BOB! 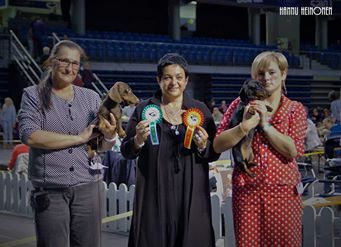 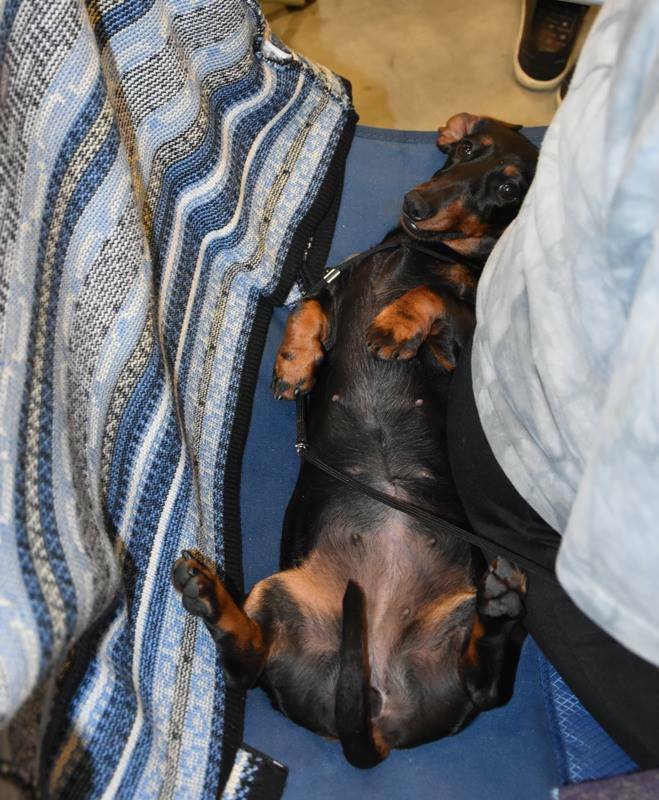 Magik Rainbow First Love MS - JCAC, JBOB, BOB, BOG-1 & Best In Show Junior-3! 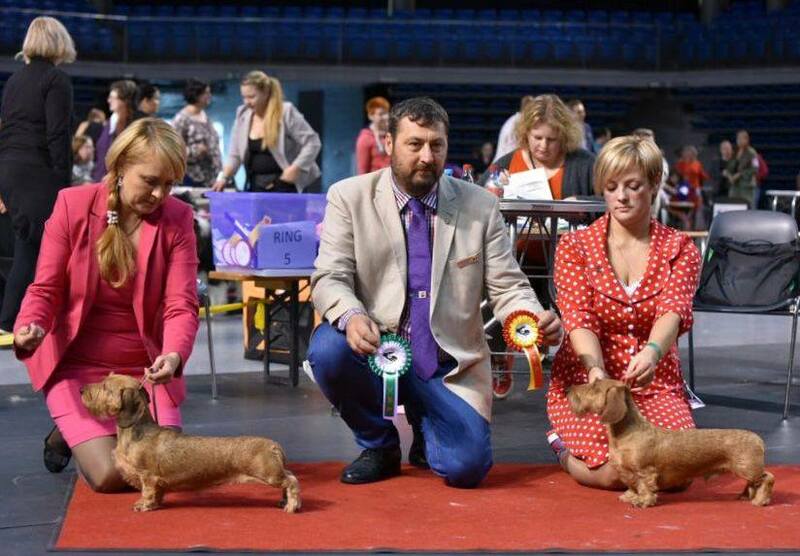 BIS-1, BOG-1, BOB, CACIB - Magik Rainbow Verino Roberto Gold MW!!! 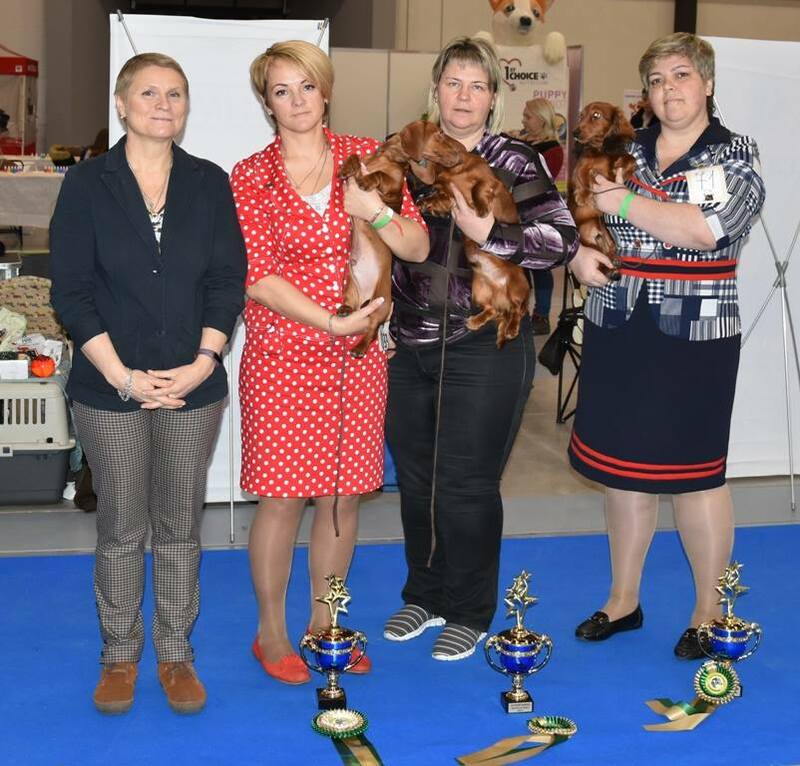 MAGIK RAINBOW VERINO ROBERTO GOLD MW - CAC, CACIB, BOB, BEST OF GROUP-1 & BEST IN SHOW! 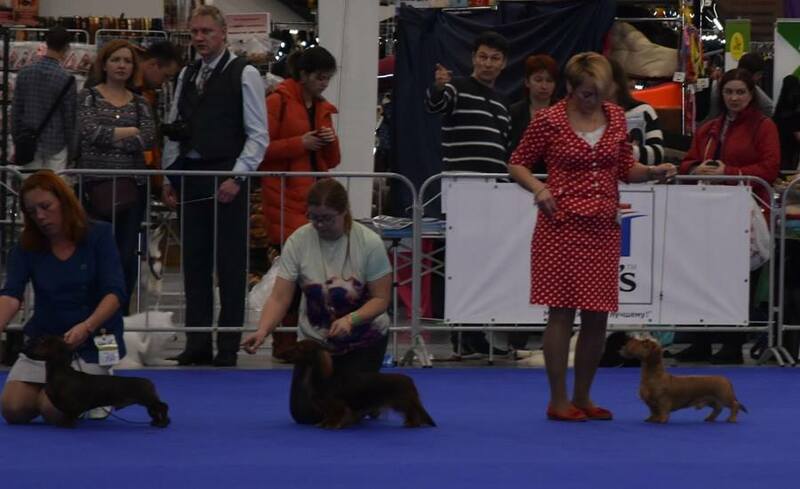 MAGIK RAINBOW KONSTANCE MS - CAC, CACIB, BOB & res. 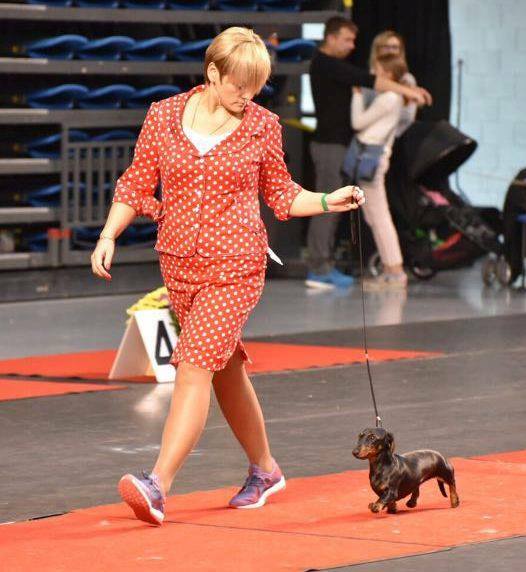 BOG! 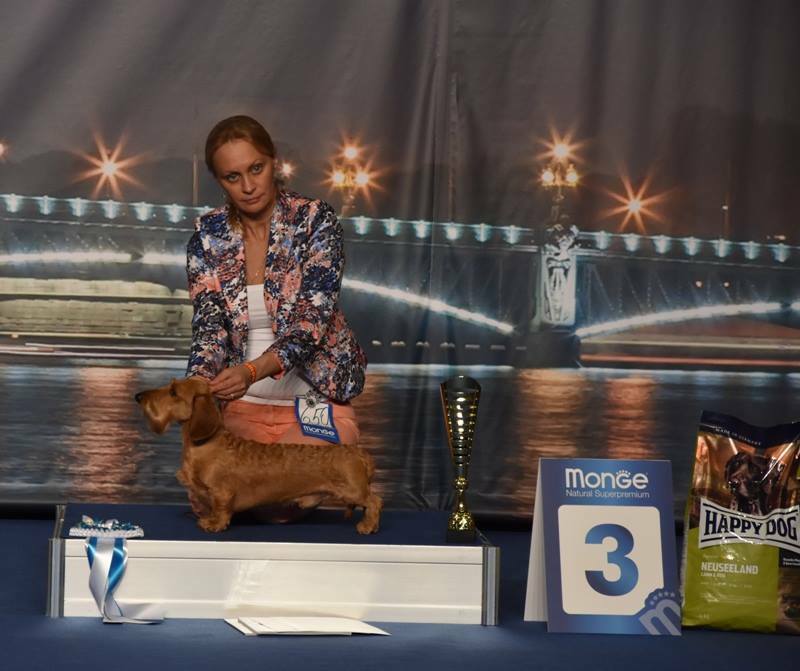 MAGIK RAINBOW ANGEL KISS MW - CAC, CACIB & BOS! 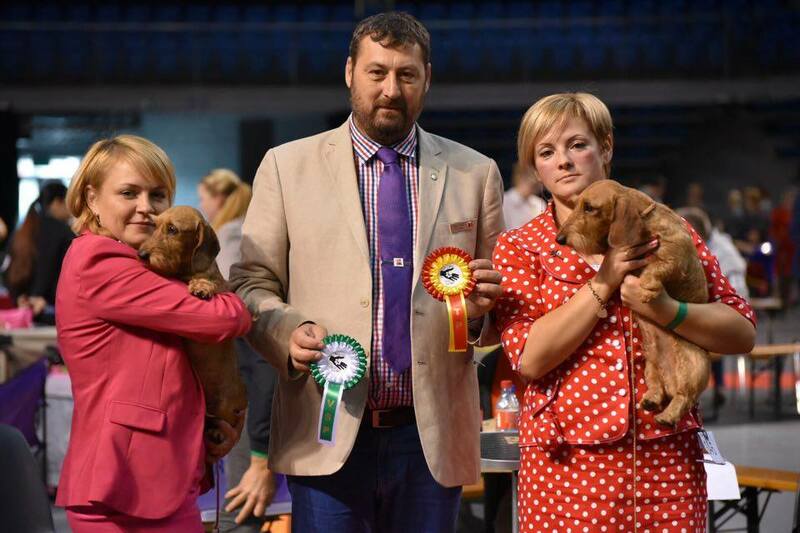 MAGIK RAINBOW ZZ TOP KS - CACIB & BOB! 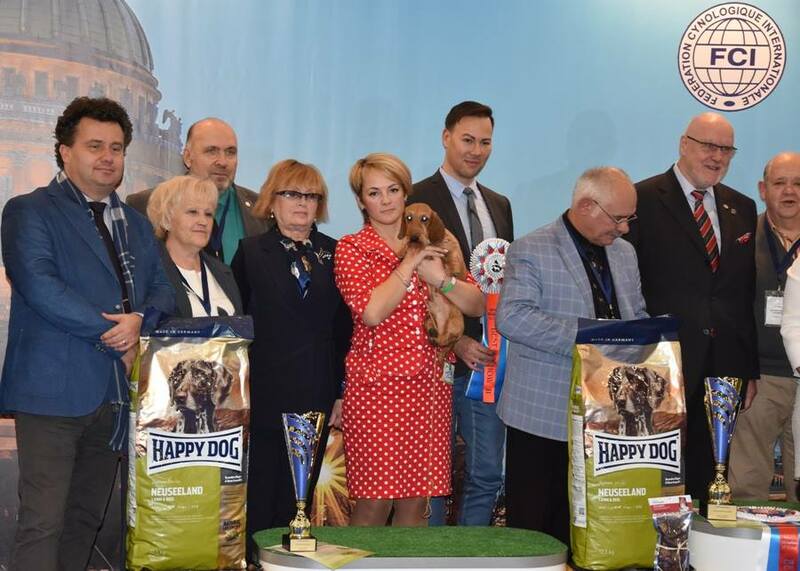 Congratulations to all owners and co-owner! 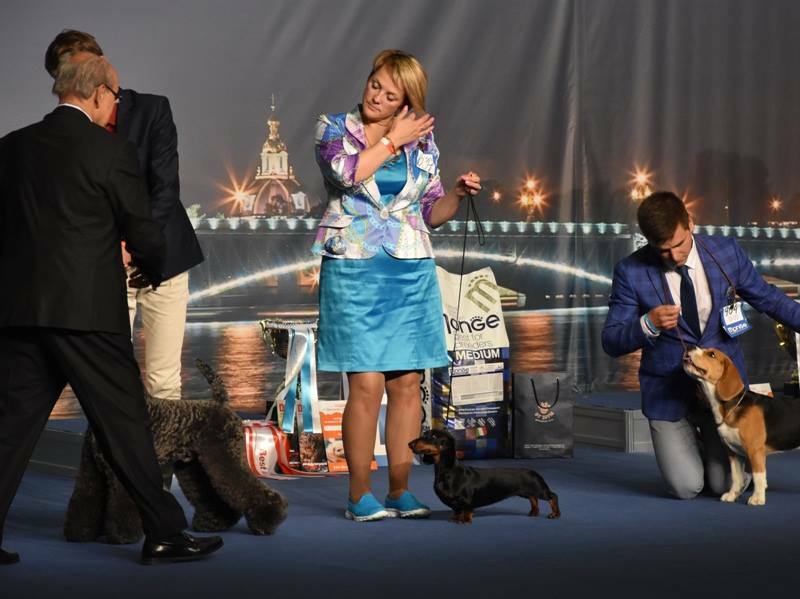 24.06.2017 - IDS "White nights 1"
Magik Rainbow First Love MS - JCAC & JBOB! 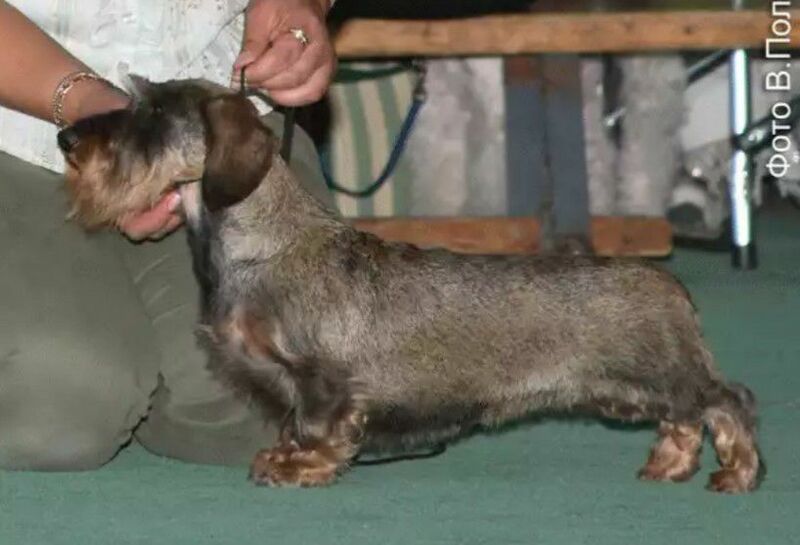 Magik Rainbow Francois Charles MS - JCAC! 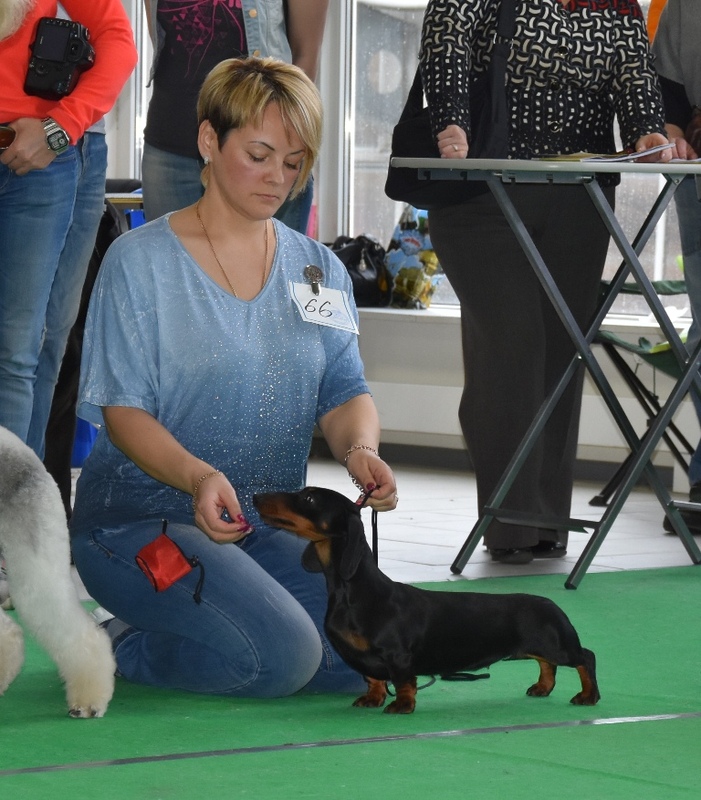 Magik Rainbow Konstance MS - JCAC, JBOB, BOB & Best of Group-1! 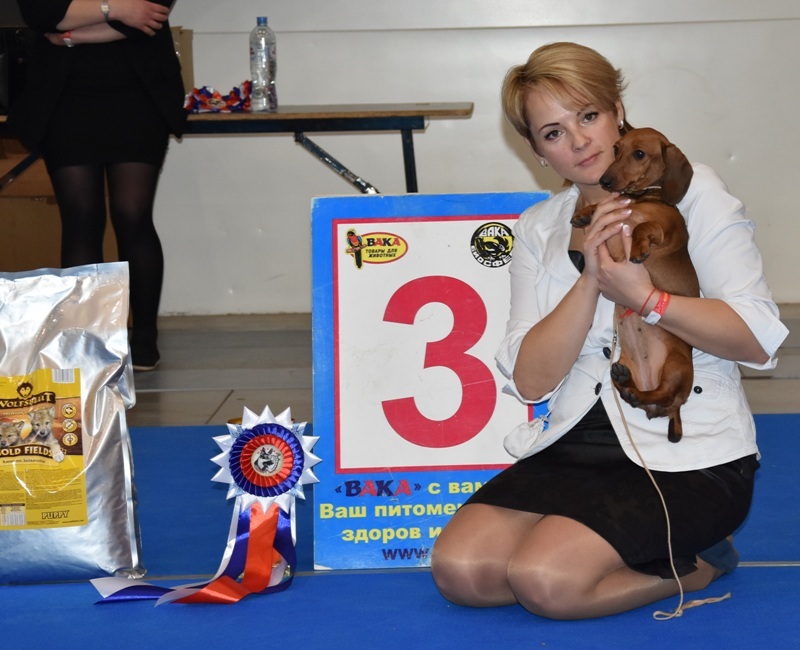 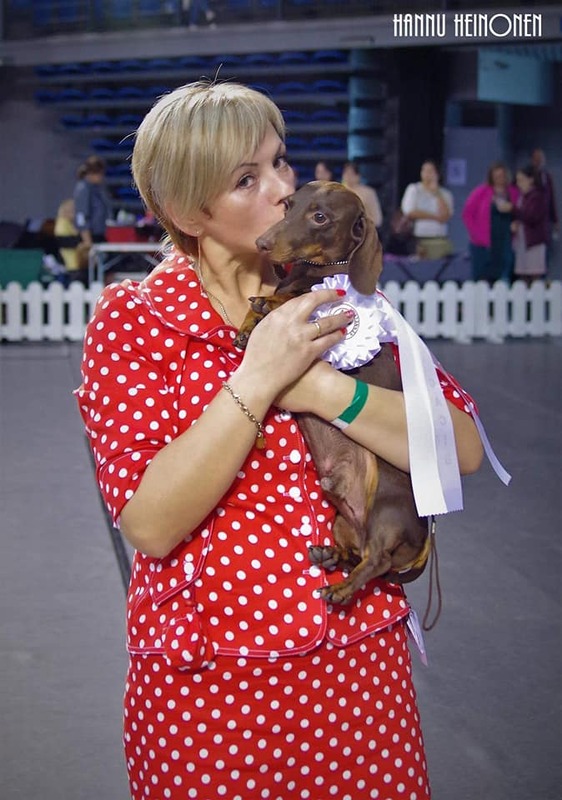 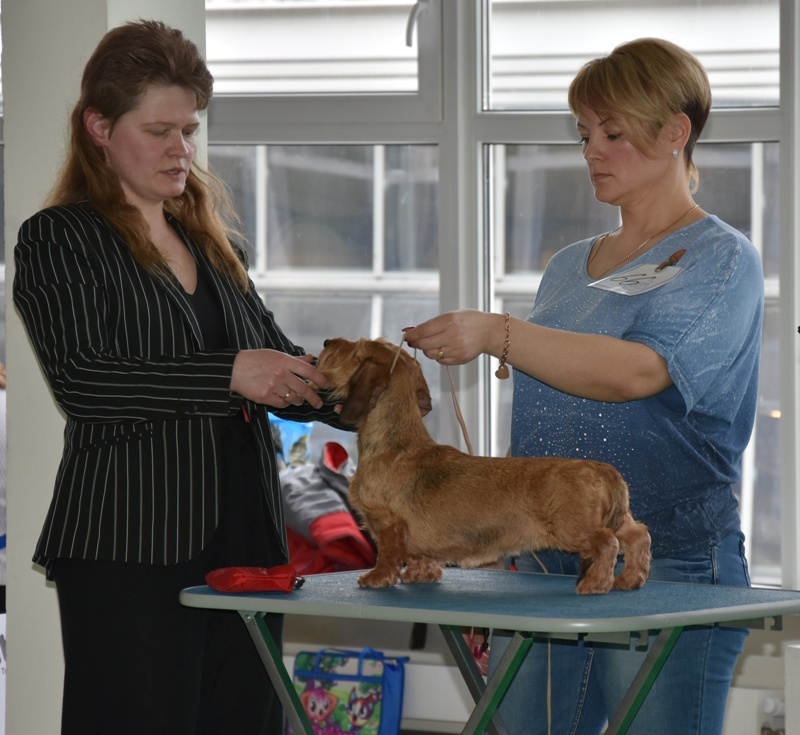 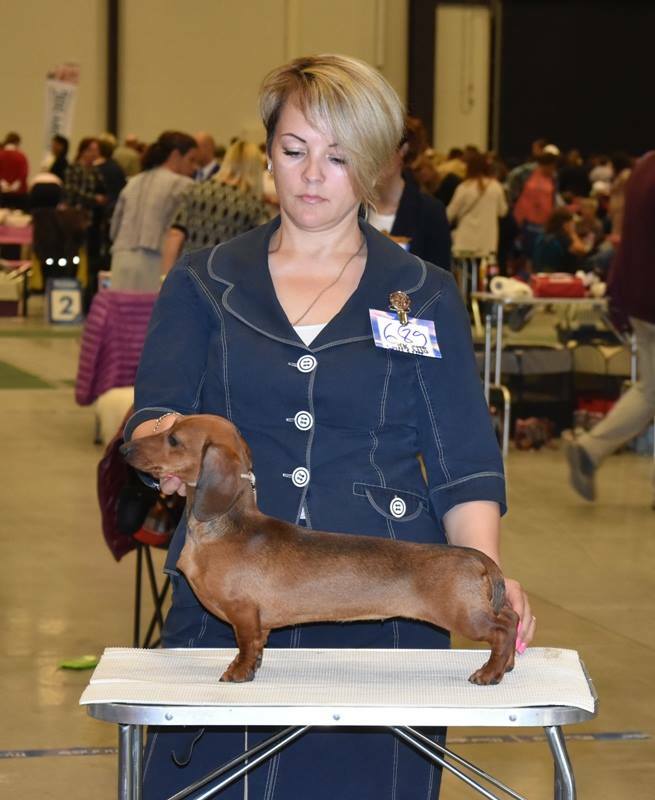 Magik Rainbow Francois Charles MS - JCAC, BOS & close Junior Champion Russia! 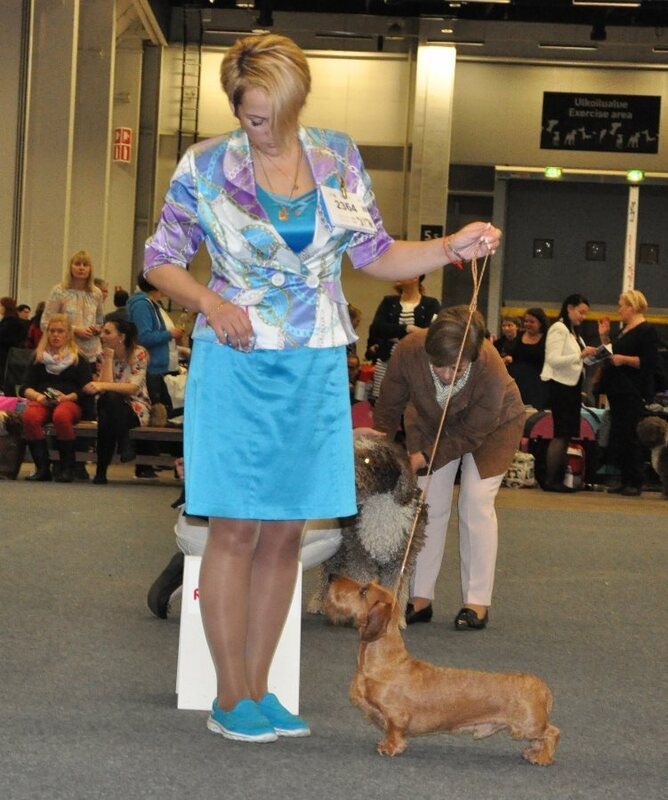 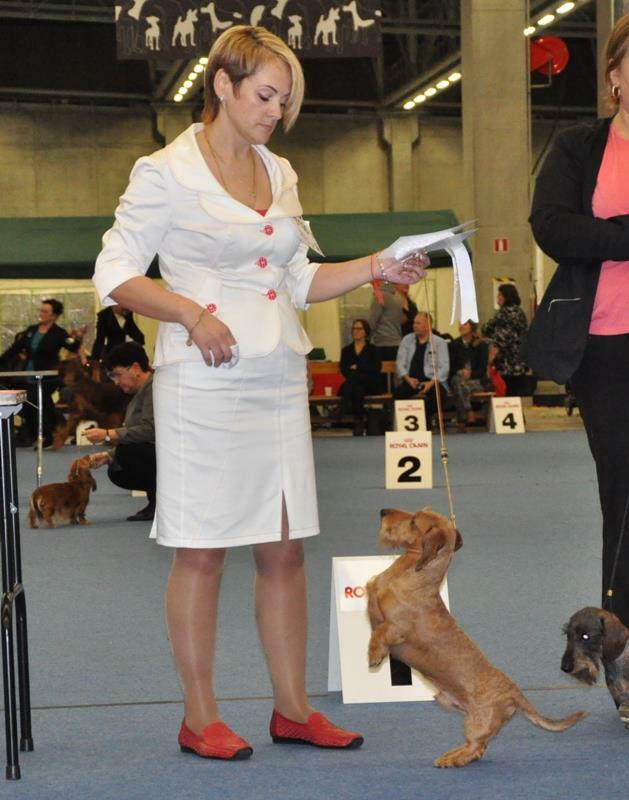 Magik Rainbow Verino Roberto Gold MW - CACIB, Ch. 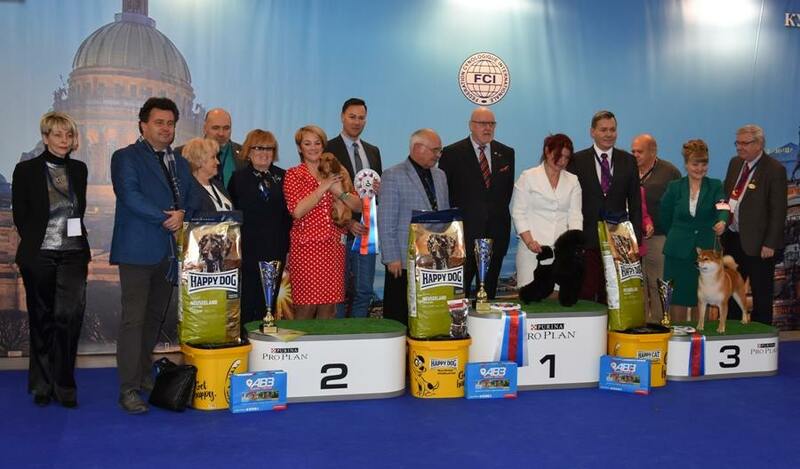 RKF, BOB & Best of Group-3! 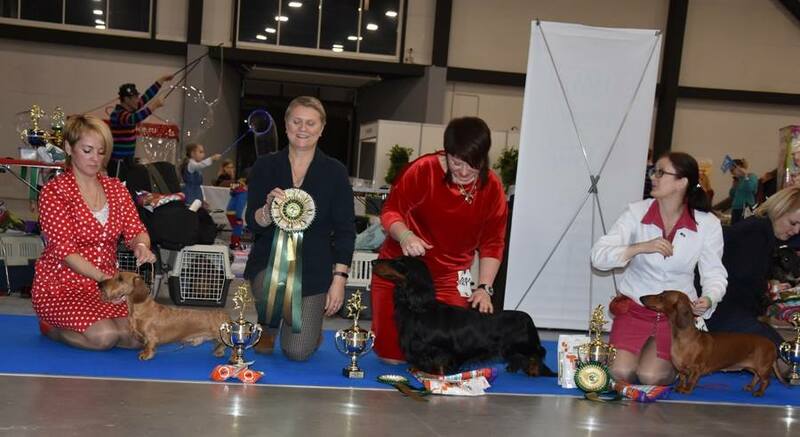 Magik Rainbow Konstance MS - JCAC, JBOB, BOB, BOG-1, res.Junior BIS & res.BIS! 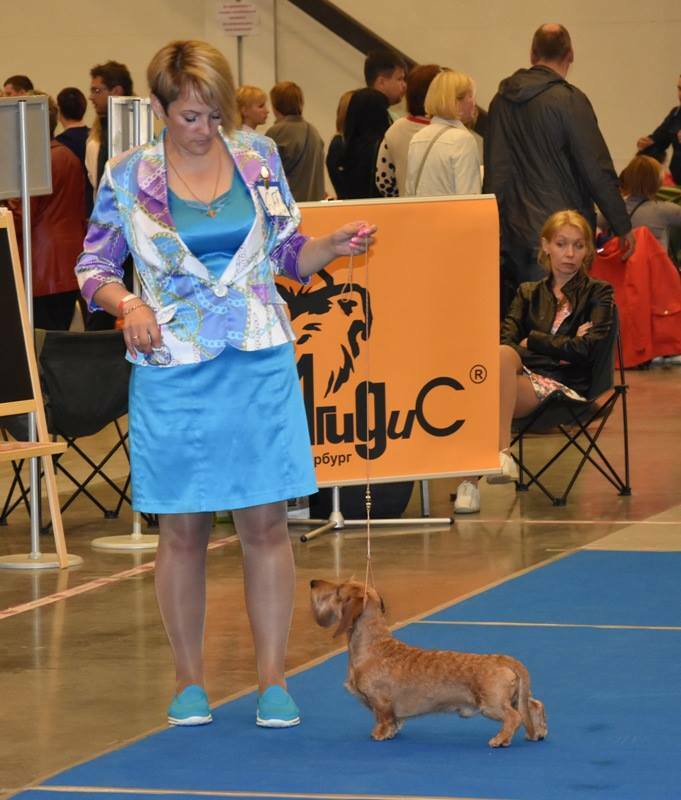 Magik Rainbow Konstance MS - JCAC (new J.Ch.Russia), JBOB, BOB,BOG-1, res.JuniorBIS & res.BIS!